Chiltern-Mt Pilot National Park is somewhat fragmented and the camping areas marked on the map are not widely advertised however, we did find a lovely quiet spot where we enjoyed a few days on our own. 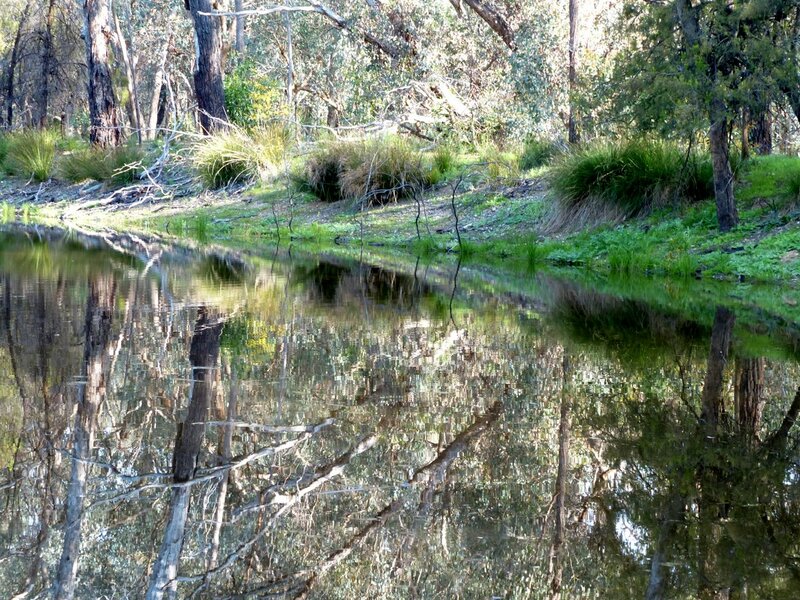 This lovely pond was a few metres from our camp ….. beautiful reflections in the still water. There was more activity on the water surface than was first apparent! 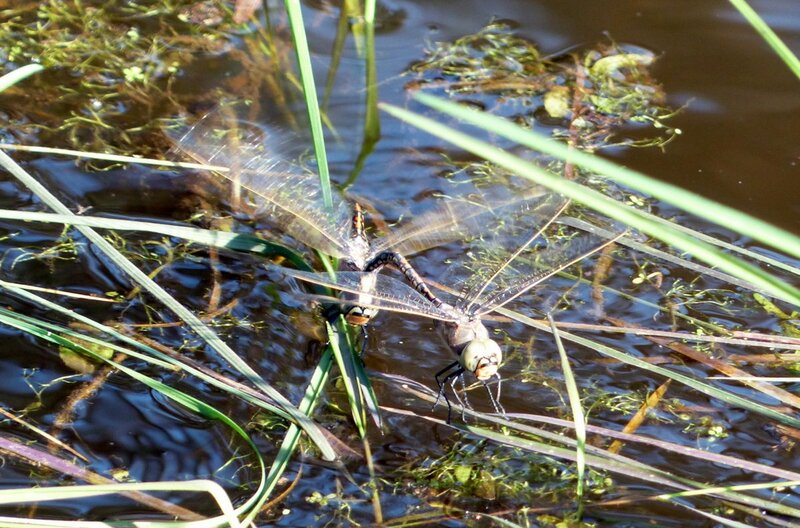 This pair of Australian Emperors were flying ‘together’ while the female laid eggs in several locations around the pond. Awake with the birds on our first morning, we set off early on the Tuan Track walk, collecting a leaflet provided by the Friends of Chiltern National Park on our way. It is a lovely walk and the weather was perfect with some sun to warm us and only a gentle breeze. 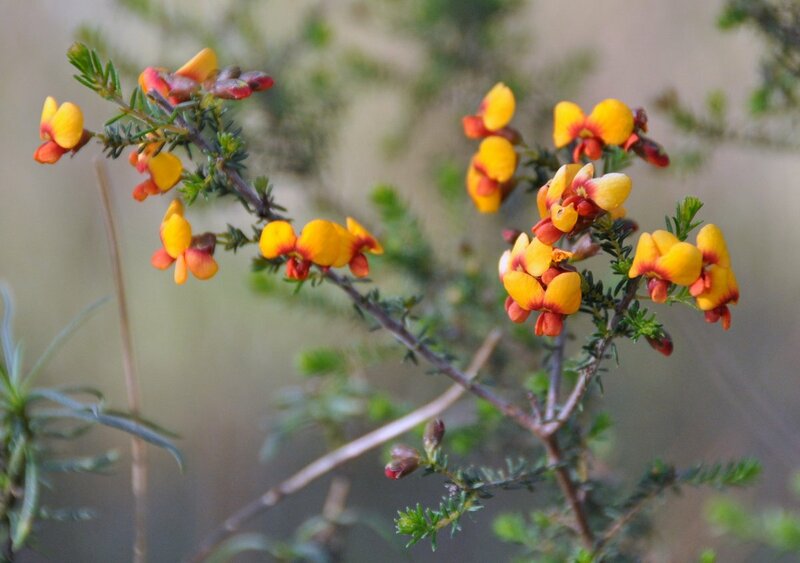 With the aid of the descriptions in the leaflet we were able to not only appreciate the change in vegetation as we progressed along the track but also identify a few species. 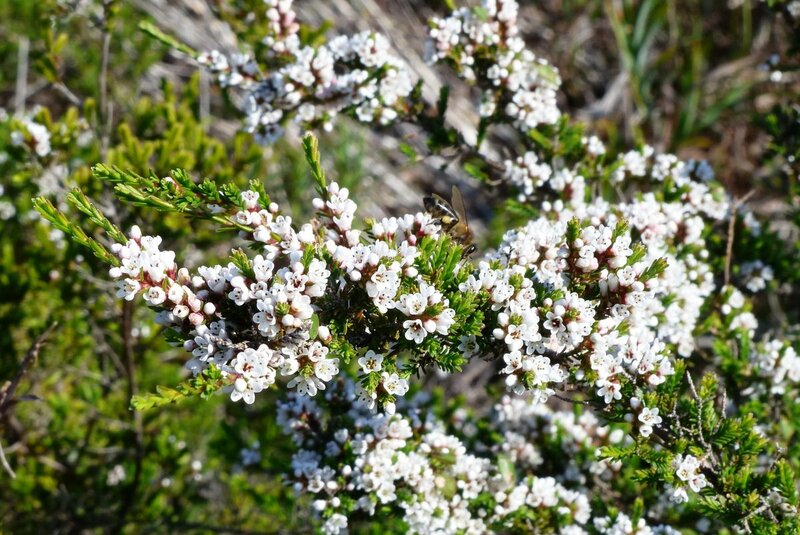 It was also interesting to note the dominant bird species associated with particular flowering plants and along different sections of the track. 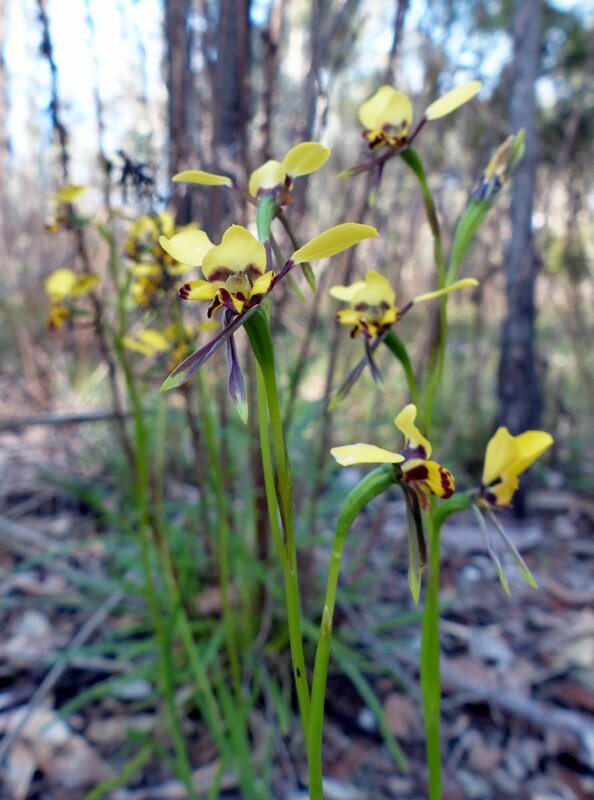 Donkey Orchid – Diuris sp. 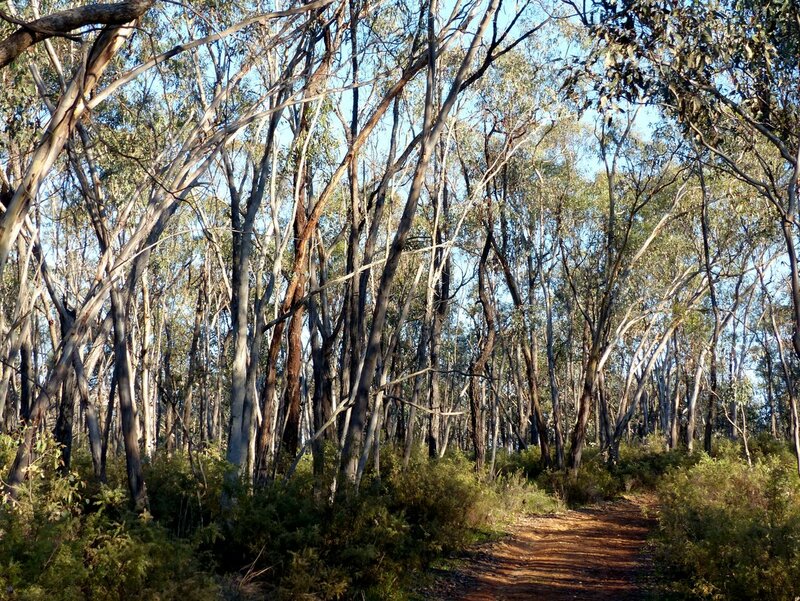 Other highlights of our few days exploring the variety of tracks in this national park included a morning walk at the Yeddonba Aboriginal site. A very pleasant stroll along their well set out ‘self-guided’ tour gave us a different perspective and a chance to imagine how the country looked before our European ancestors cleared much of the beautiful forest. 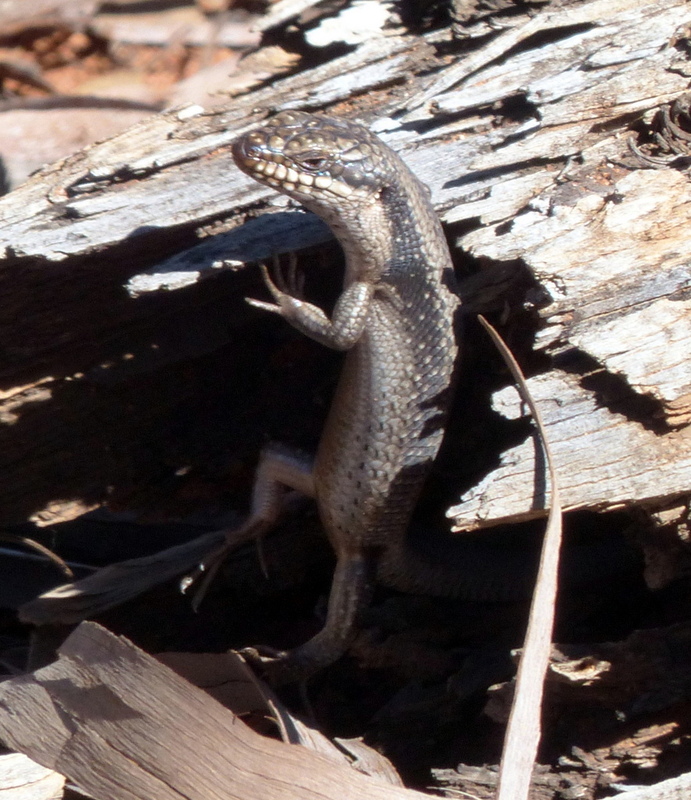 We then drove on to the Mt Pilot section, parked the car for a short walk up to the summit and Allen spotted this delightful creature snoozing in a dead Callitris. 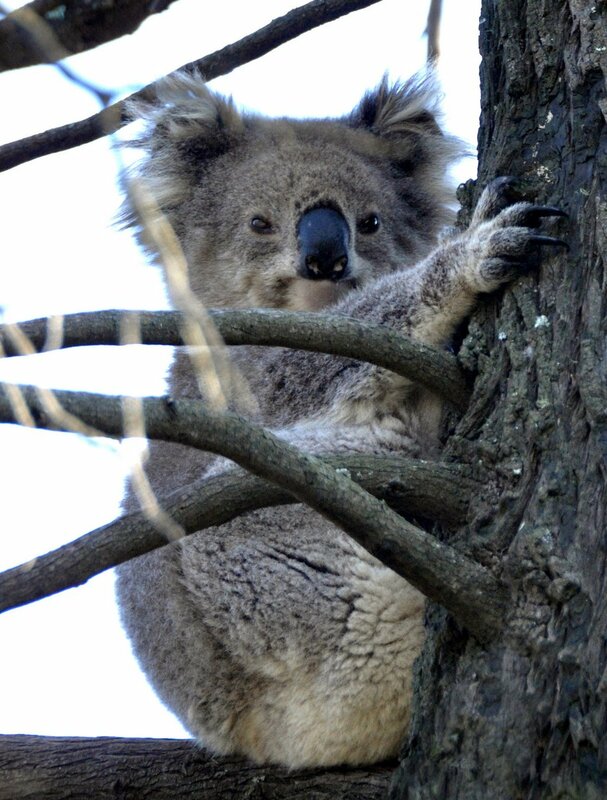 Koala woken briefly by our conversation. A short stroll to the summit revealed 360 degree spectacular views. 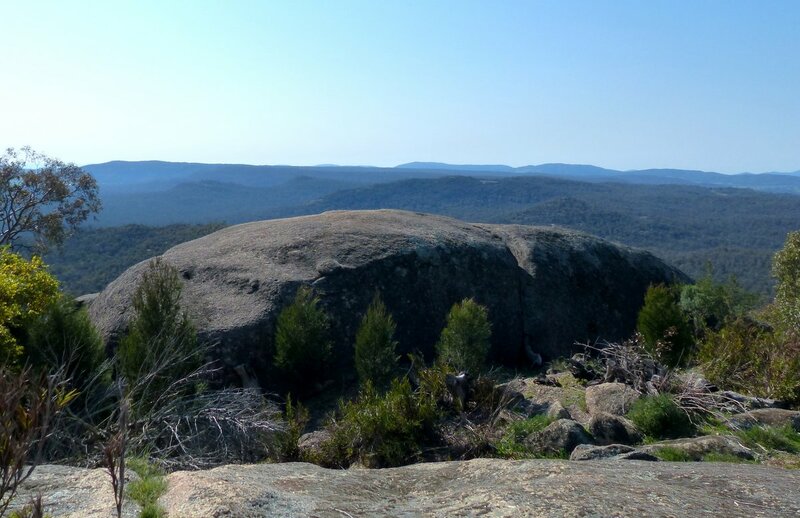 Enormous granite boulders on the summit support a surprising variety of vegetation that manages to not only survive but thrive in the extremes of summer heat and winter cold. 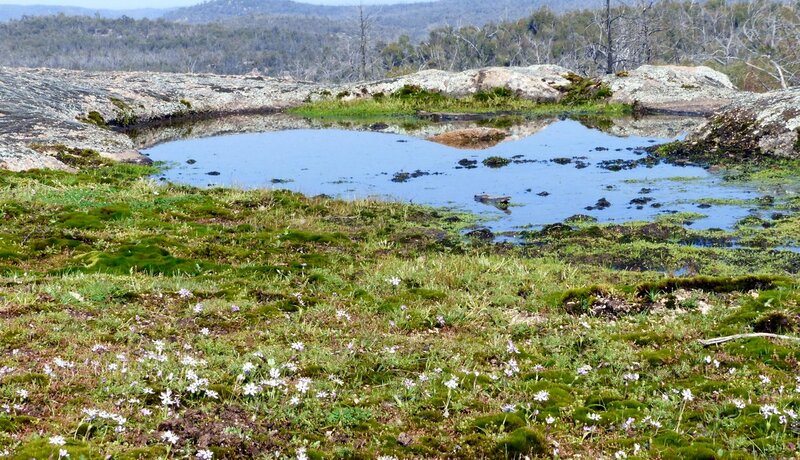 Some plants have found shelter between granite boulders or have taken root in cracks of the boulders but the most entrancing ‘miniature garden’ grew around a large pond which had formed in a dip in the rock. 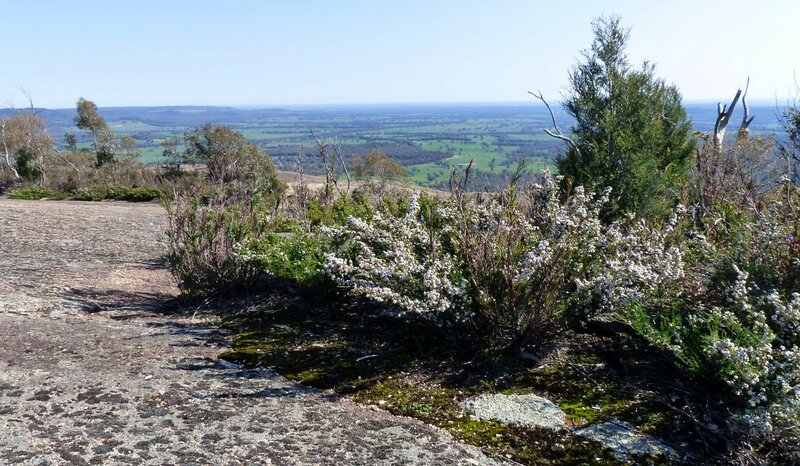 After exploring the summit for a while we returned to the carpark to enjoy our morning coffee as well as the sight of a Scarlet Robin followed by a chestnut-rumped Heath-wren. 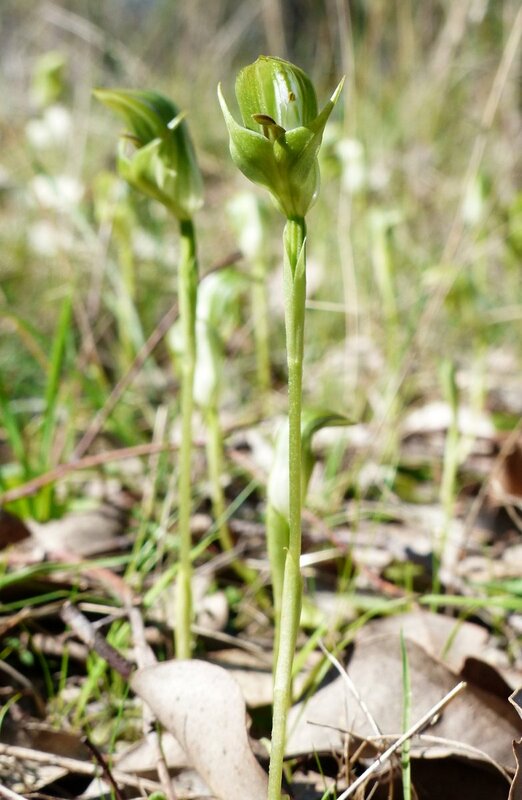 We kept our eyes out for a glimpse of a Spotted Quail-thrush – no luck there but we did find a lovely patch of Greenhood orchids. We are not certain of which Greenhood but someone may be able to help us. 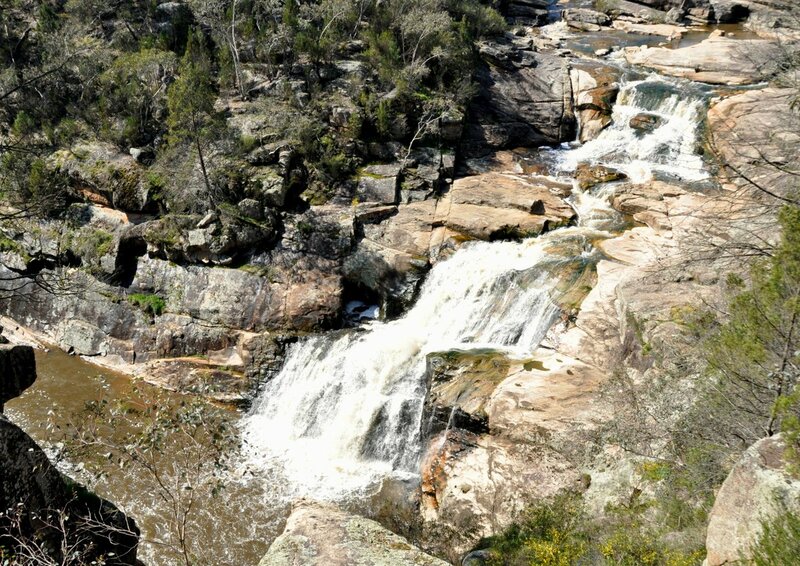 Then we drove on to Woolshed Falls with its impressive granite race leading to the main falls – extensive paving with granite steps makes for very easy access to the viewing areas. As we quietly enjoyed our picnic lunch we heard the unmistakeable creaky calls of some Gang-gang Cockatoos who alighted not far from us and sat in the tree apparently undisturbed by us walking around trying to get a better angle for a photo. 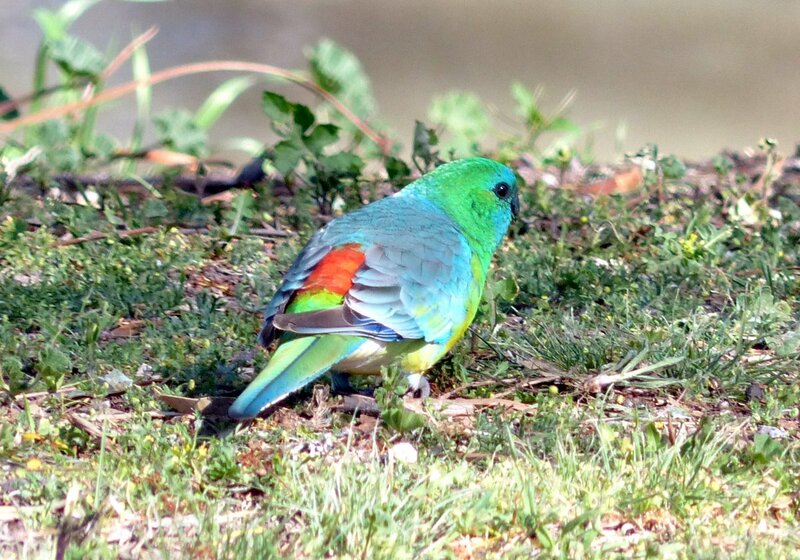 On our last day in Chiltern-Mt Pilot we were finally rewarded with a good sighting of a Turquoise parrot which, although not a first for us, was another on the list. This is my final entry for our 2013 camping excursion – it was a wonderful journey, we did cover a lot of ground and there are many places to which we would like to return. 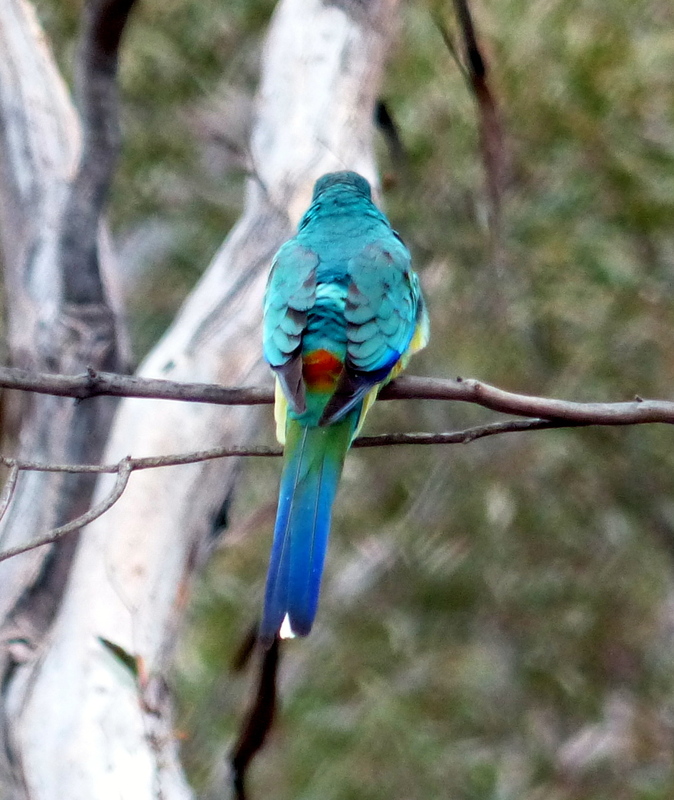 We have been considering calling it our ‘parrot trip’ as we saw many species of parrot, new to us. And so we travelled on to the Brisbane environs where we enjoyed some special time with grandchildren for a couple of weeks before travelling home up the coast. 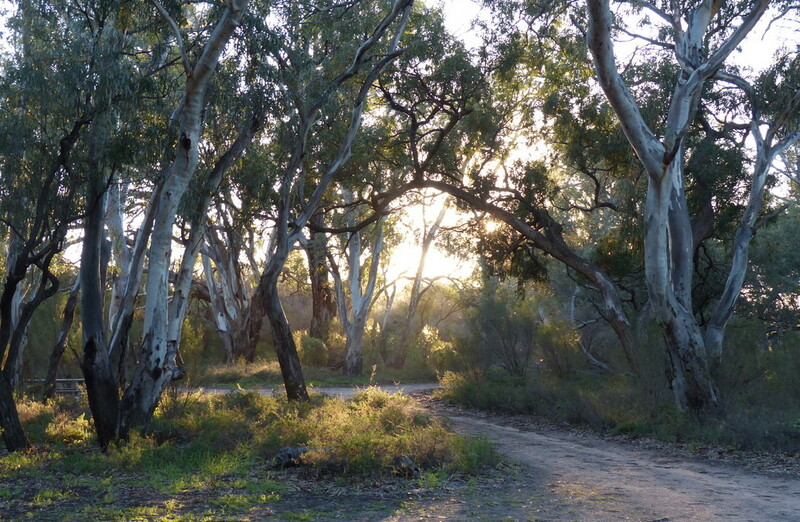 Birdlife Australia manages Gluepot reserve and bird watching was initially the main attraction, yet so far my dissertations have featured only a couple of species. 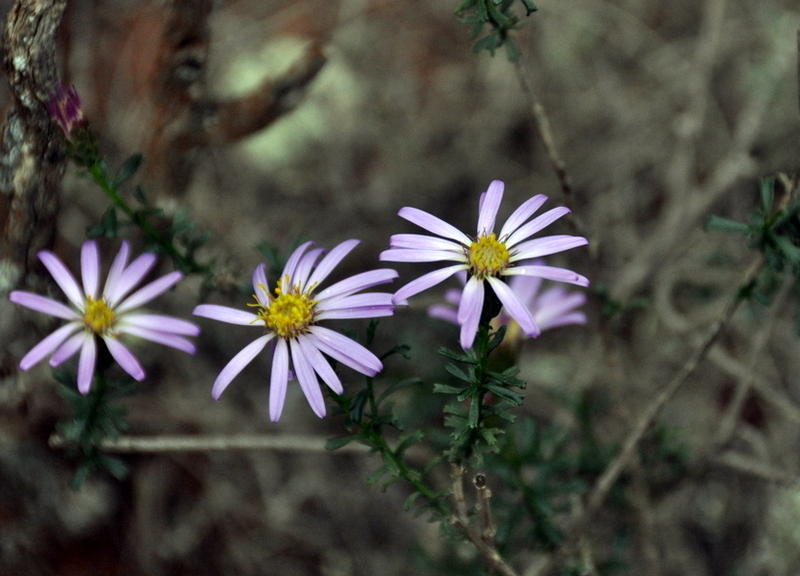 This is mostly due to some difficulty in producing adequate photographic illustration. 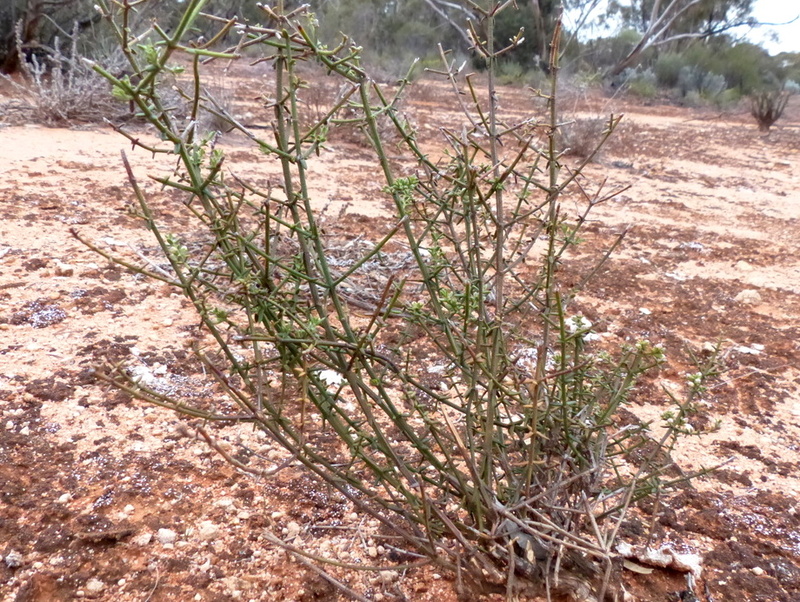 As the weather cleared and the wind dropped bird activity certainly increased – we saw Chestnut-crowned Babblers, Crested Bellbird, Mulga Parrots, and Mallee-Ringnecks. 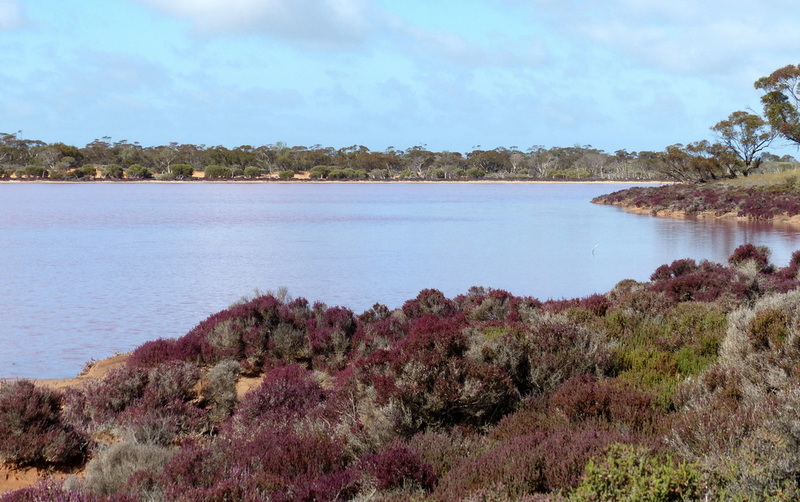 We found both White-winged Fairy-wrens and Splendid Fairy-wrens, Allen got a few glimpses of a Red-lored Whistler but it certainly didn’t wait for me to get a good look. 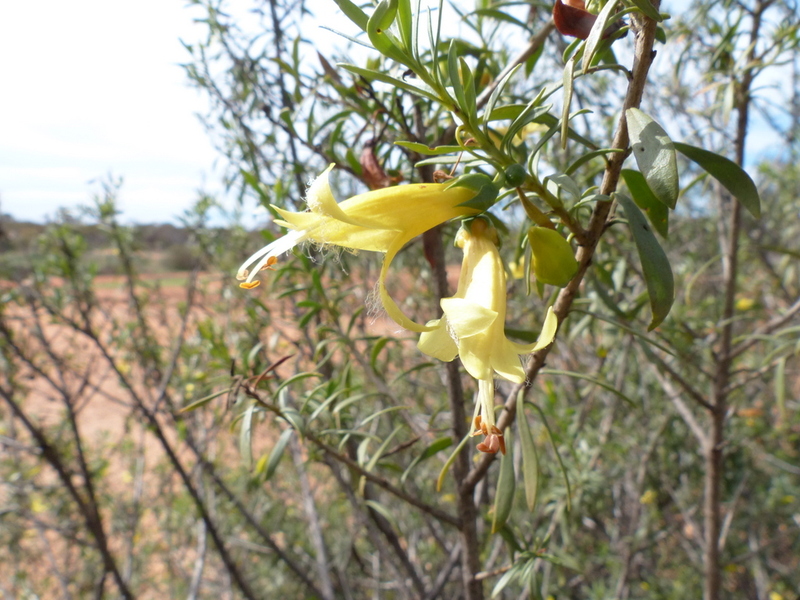 Honeyeaters included Brown-headed, White-fronted, Spiny-cheeked, Yellow-plumed (in great numbers), White-eared and Striped. 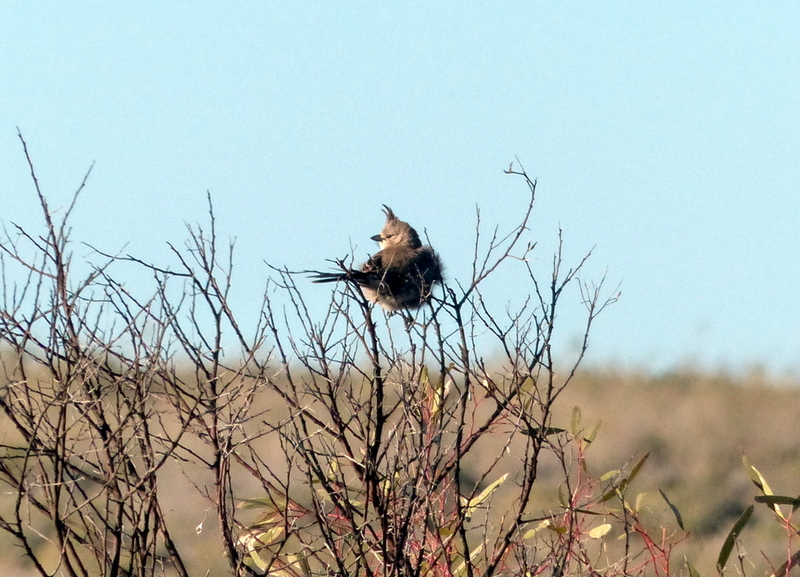 Many, many thornbills; Inland, Chestnut-rumped, Brown, Yellow, Yellow-rumped and Slender-billed Thornbills – where ever we went there seemed to be some Thornbills busy feeding amongst the foliage, most often in the Mallee Gums. 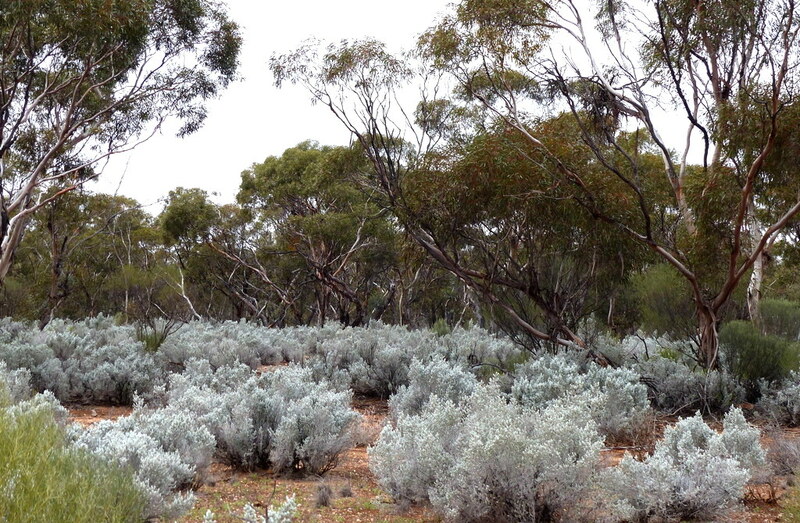 The advantage of bird watching in the Mallee is that the average height of the trees is much less than we are accustomed to in the rainforest and it makes identification so much easier. 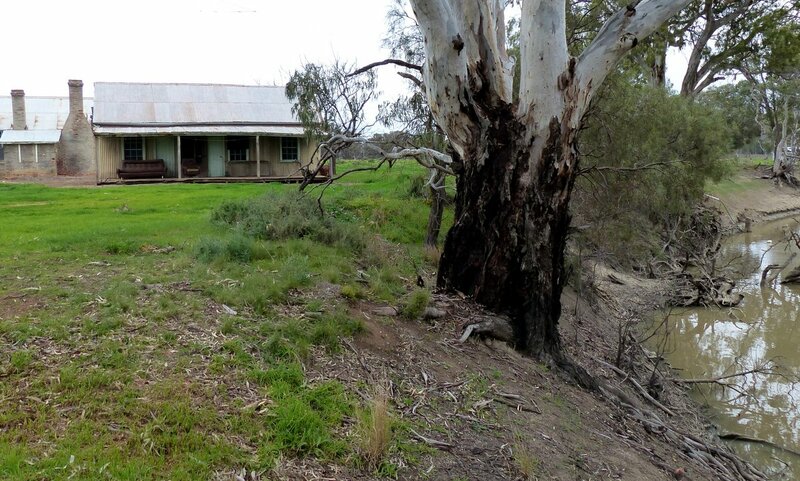 A well numbered spread of tracks lead to varied and interesting locations around Gluepot; there were many places to explore not far from our camp at ‘Bellbird’ however we did travel over to old Gluepot in the SW of the reserve to look at the remains of the original homestead. The most interesting part was the cellar, presumably a cool store for food, which still appeared in relatively good condition. On our return to camp a flock of Miners crossed the track in front of us. A rapid halt and we were out of the vehicle trying to get a definite identification as this flock of 20+ moved through the trees. Not being a gambler I wouldn’t put money on this but they did appear to be Black-eared Miners although with the difficulties presented with the hybridization of the species with Yellow-throated Miners we can’t really be certain. 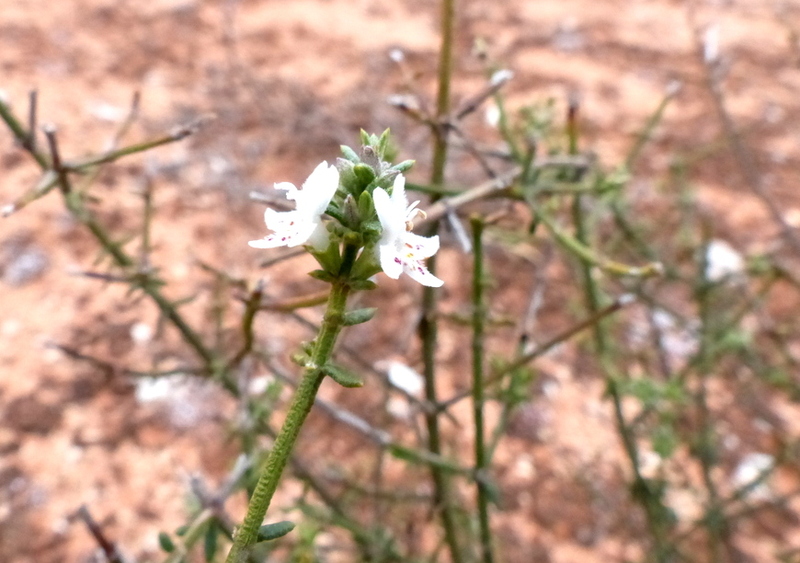 Flowers are not always very obvious until you look closely – this Westringia rigida – Stiff Westringia is a good example. Not the sort of form you would look for in a garden plant but on closer examination there were some rather lovely flowers. 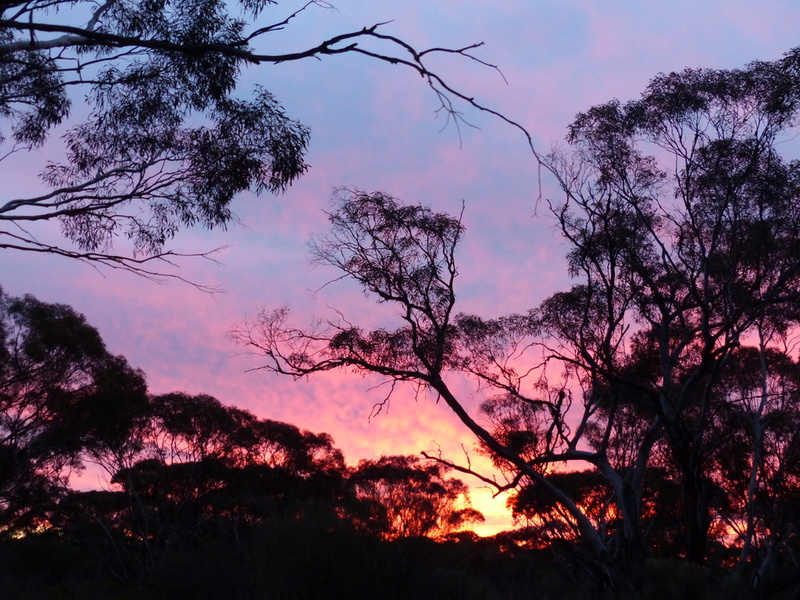 And a magnificent Mallee sunset on the eve of our last day was a fitting end to our first Gluepot visit. A big gap between posts …. too difficult to keep up when we were often out of range and then there was the delightful distraction of our adorable grandchildren. I’ll gradually catch up – we are now home again and appreciating our own backyard which, in spite of a few weeds, is looking particularly beautiful. 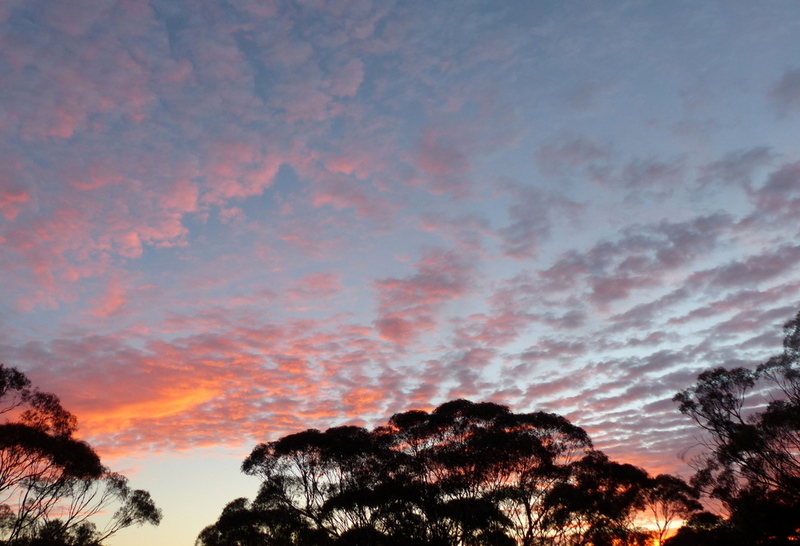 Having retreated from the Coorong in the lull between storms we spent a lovely few days with one of Allen’s sisters who happens to live right near the Barossa Valley. 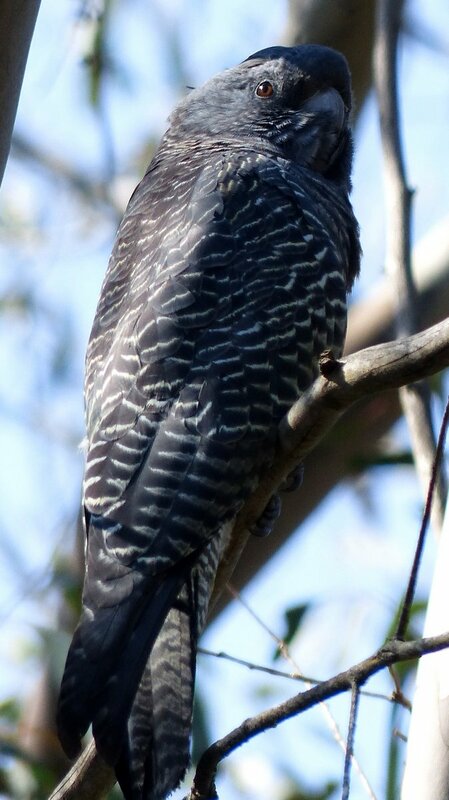 Bird watching is a wonderful occupation and we are very happy spending time amongst native vegetation but we also appreciate any form of horticulture and that includes vineyards. So when we left for Gluepot we did have a couple of bottles of red packed safely with our food stores! 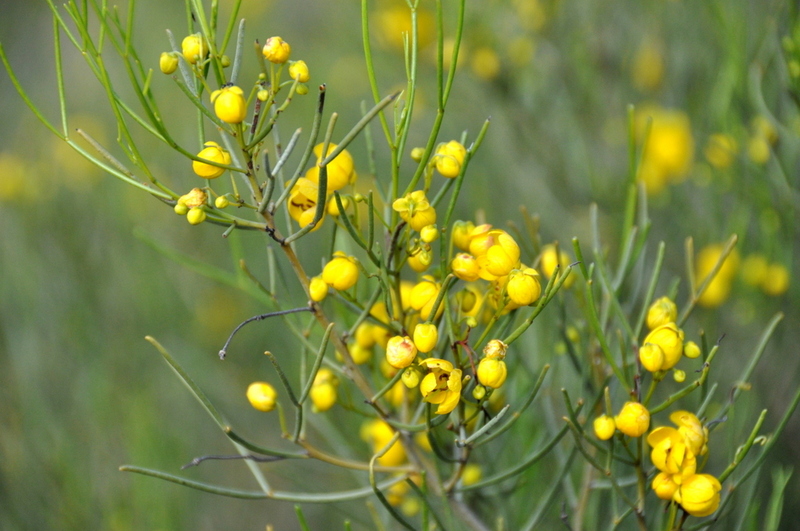 We were inspired to visit Gluepot after reading several Gouldiae reports on his visits there. 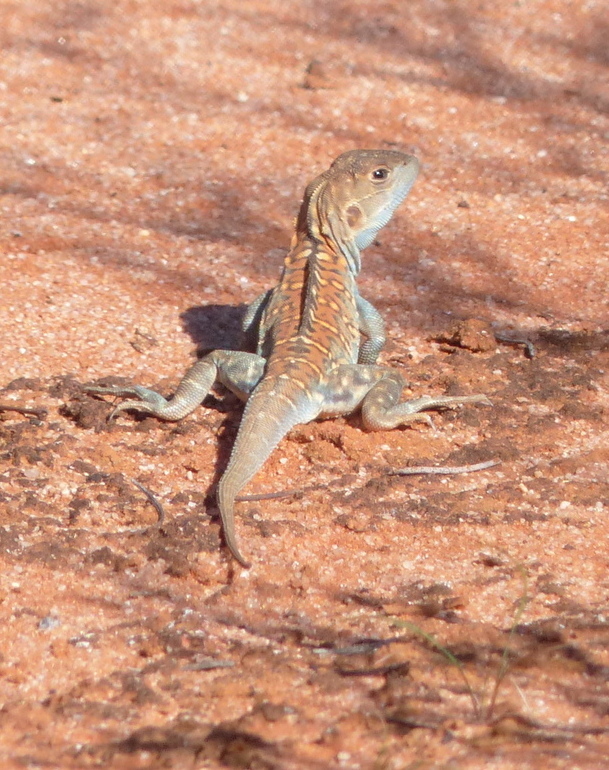 We now understand why he is so fond of this reserve and revisits regularly. On arrival it is a requirement to book in at the visitor centre and we were delighted to find lots of information on the numbered walks and driving tracks, all of which was a great help in planning our stay. There are leaflets which describe each walk and provide additional information on the local fauna and flora which we found very interesting. This Chestnut-backed Quail-thrush was one of the first birds we saw as we were setting up our camp. 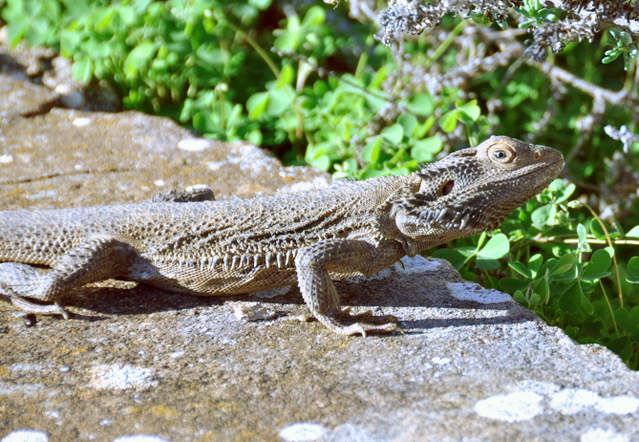 Later on he wandered quite close when we were sitting quietly, neither of us with a camera, so we just appreciated the moment….and although we resolved to keep the camera handy when sitting he didn’t wander quite as close again. 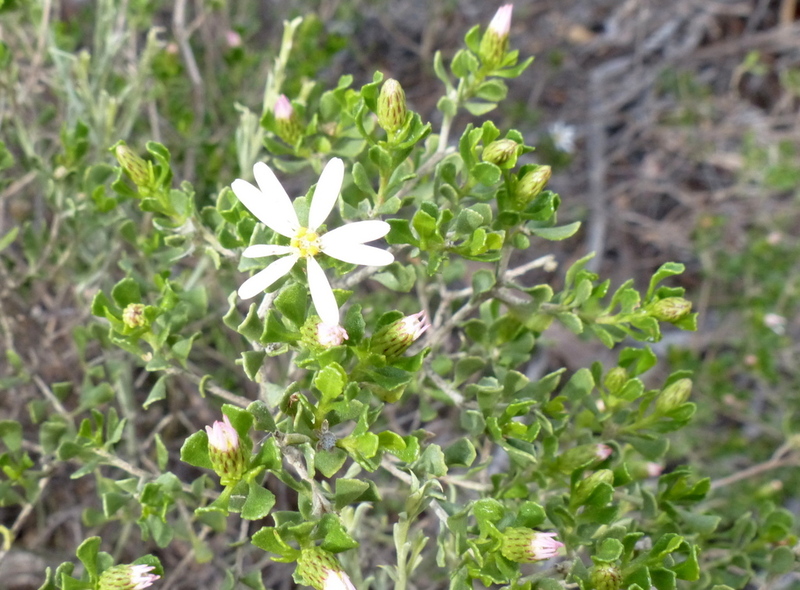 Olearia muelleri – Mueller Daisy-bush above is one of many white flowering plants. Although we were a bit early for some of the Spring flowering there were still a lot of shrubs and herbaceous plants with blooms to admire. 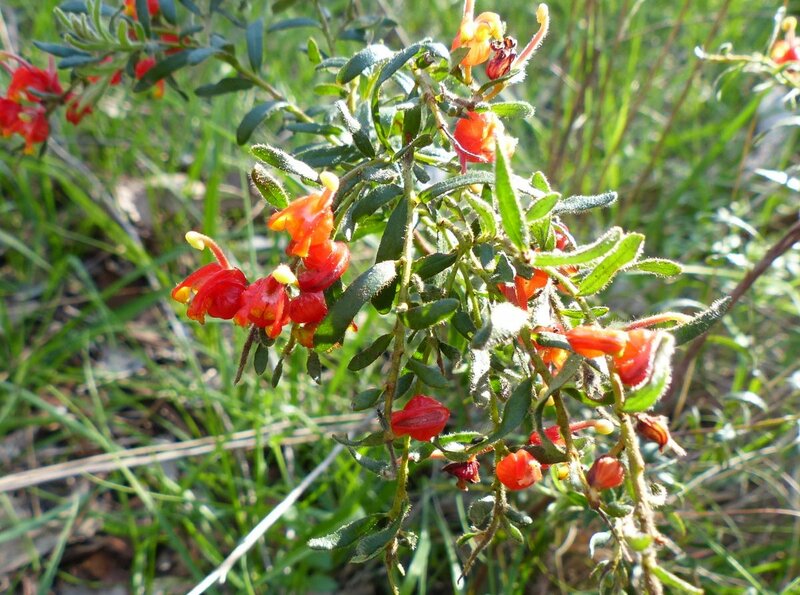 As usual we were floundering with some of the identification but I found a wonderful little publication in the Gluepot visitor centre called “The Mallee in Flower” which was quite helpful in addition to our other reference material. 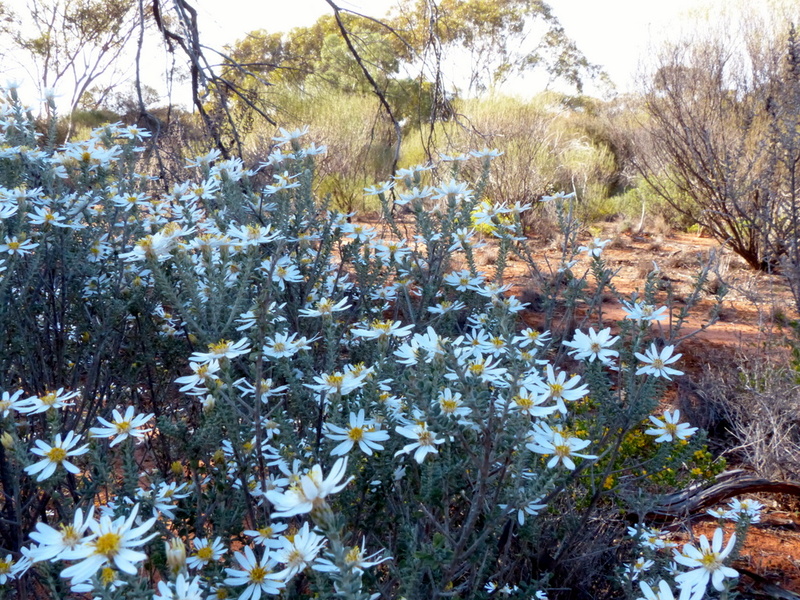 Olearia pimeleoids – Pimelea Daisy Bush above makes a striking contrast in the Mallee landscape with its lovely grey foliage while the grey understorey below is predominately made up of Chenopods. 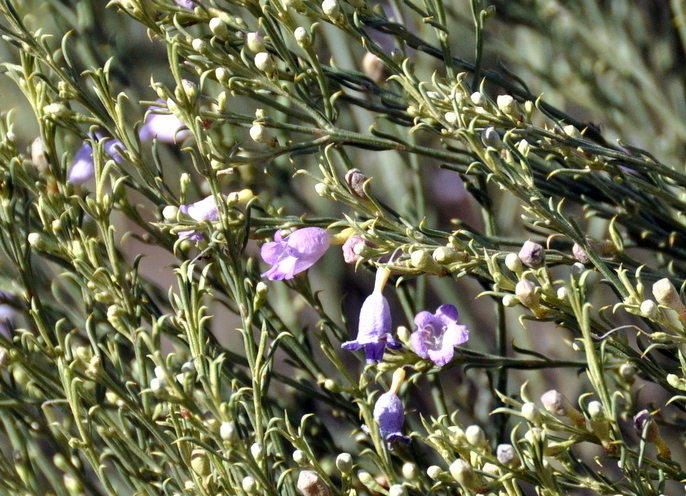 Chenopodiaceae is a large family of saltbush species and close relatives. 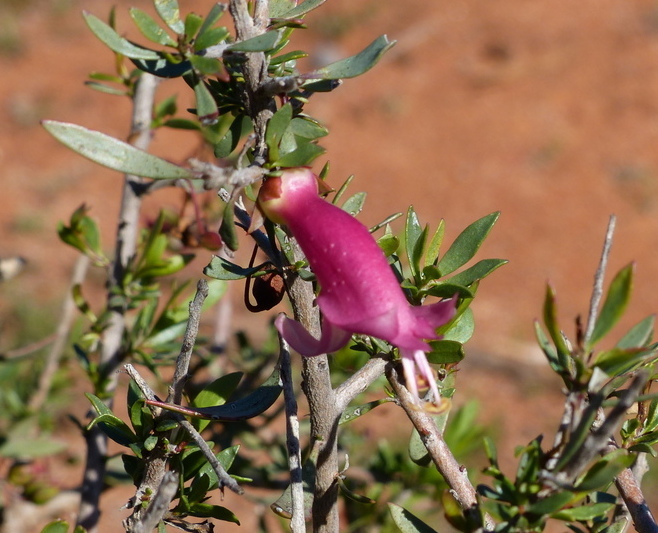 This is one Chenopod we were able to identify thanks to its colourful fruit. 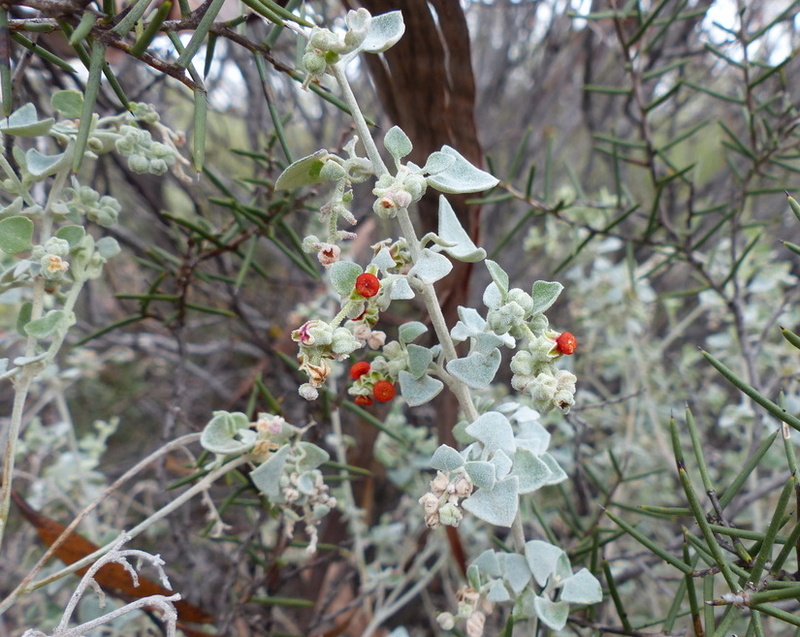 Enchylaena tomentosa commonly known as Ruby Saltbush. 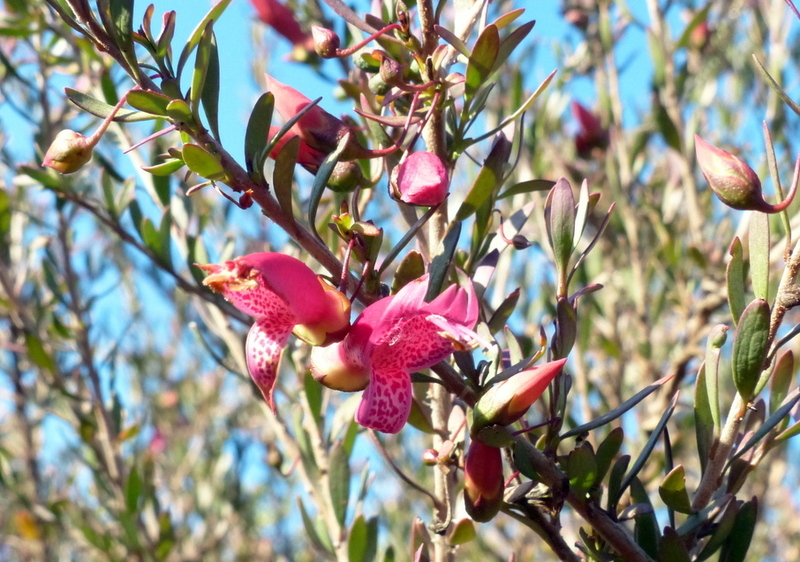 A delightful selection of Eremophila shrubs provided splashes of colour in the landscape as well as, more importantly, a plentiful nectar supply for the Honeyeaters. We hope to return to Gluepot only next time we’ll aim for a mid Spring visit, it would be very interesting as well as a spectacular experience. We headed south from Murray-Sunset with some trepidation on my part as we had been unable to check the forecast and I wasn’t looking forward to any more cold weather. 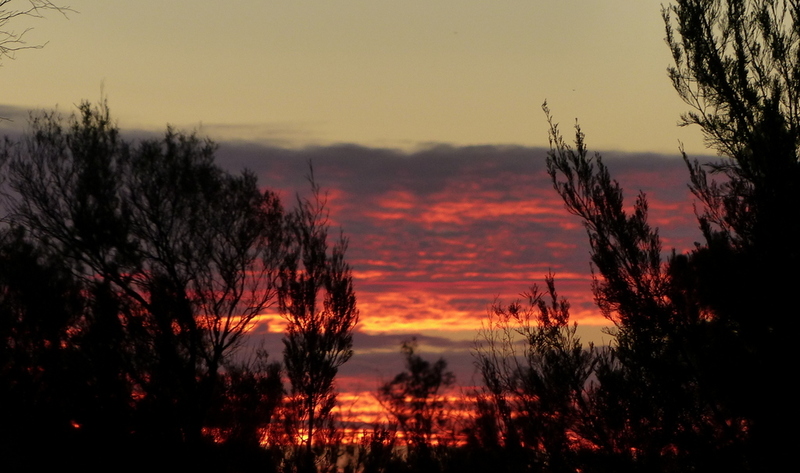 We booked into the Meningie caravan park so we could have a bit of a tidy up and the next morning dawned fine, windy and cold so I put on a load of washing. 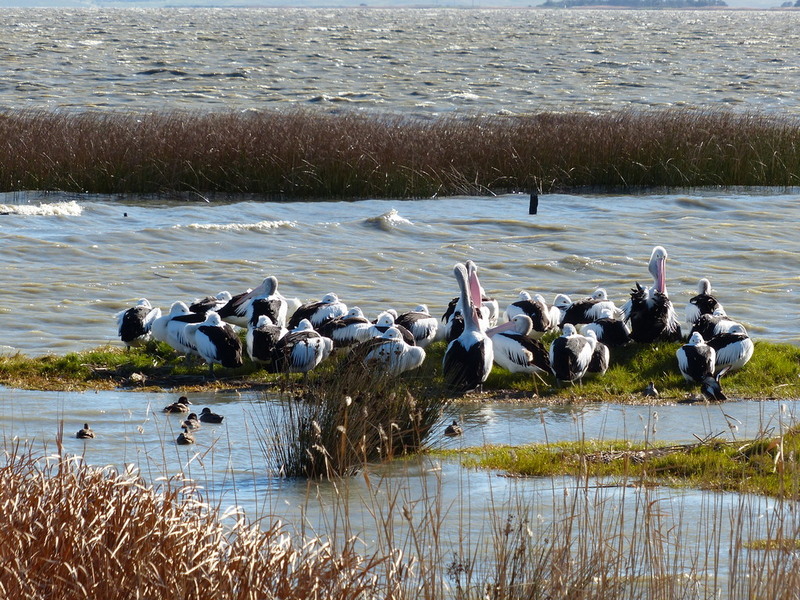 The Pelicans were huddling together to get some protection from the elements and as I was hanging out the washing a bloke passing by mentioned that gale force winds were expected. 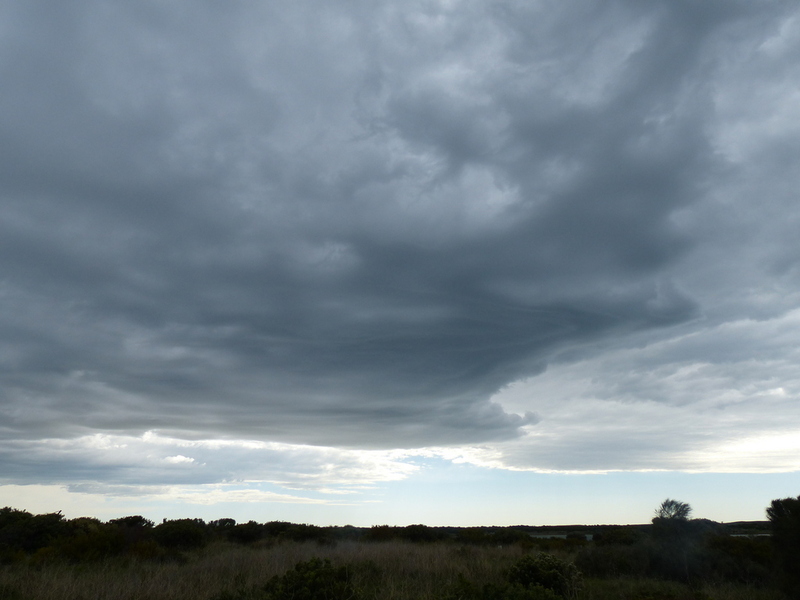 I hastened back to the tent to check the weather forecast; the outlook certainly wasn’t good so we set off for a quick drive down to the Coorong with the sky looking exceedingly ominous. The wind increased in intensity as the next cold front approached, and after taking a quick couple of photos we leapt back into our vehicle and headed back to camp as a few spits of rain began to hit the windscreen. I managed to rescue the washing which was partially dry after a couple of hours in wind and sun, enough to drape the larger items around the inside of the still warm vehicle while the smaller items fitted onto a temporary line in the tent. 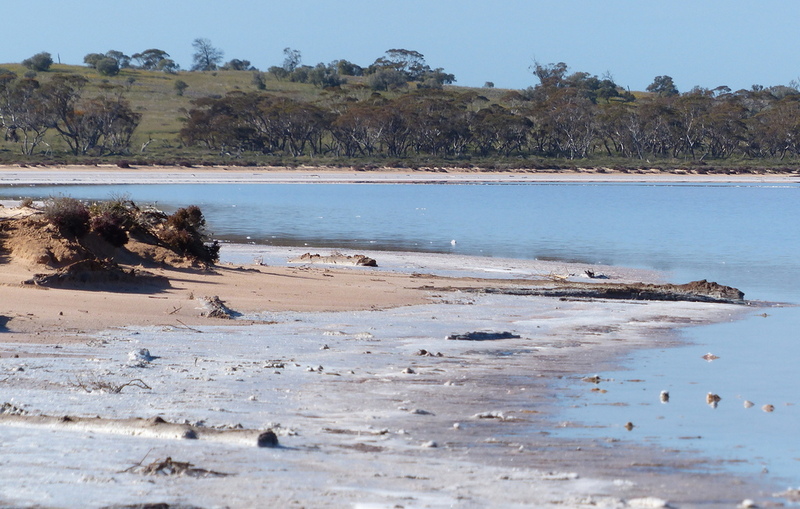 By now the waters of Lake Albert were getting very choppy and splashing against the banks of the caravan park which were being further eroded by the wave action. 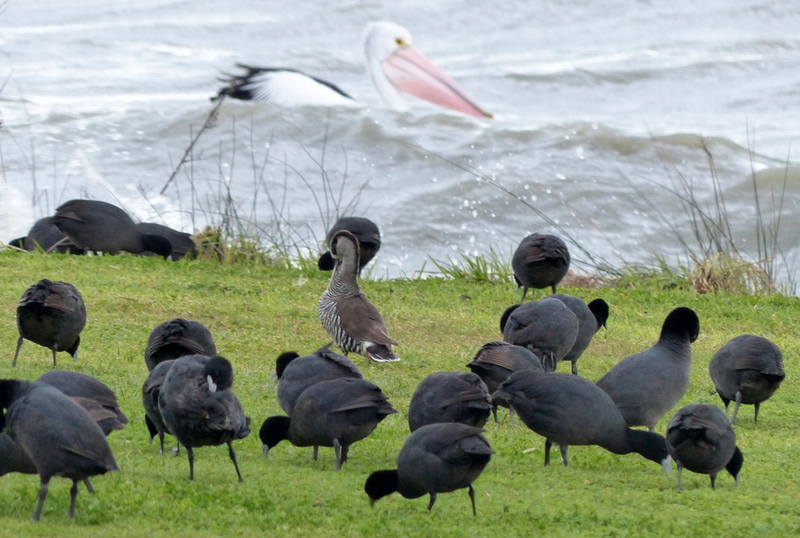 The Coots had all taken to the grass along with one pink-eared Duck but the Pelican was braving the waves. The wind increased in intensity as the rain started to fall and the temperature dropped – not a lot of fun in a tent. I was wearing two layers of thermals plus everything else warm I owned and spent most of the afternoon huddled in a blanket inside the tent annex which we had zipped up. Allen, unbelievably, was still dashing outside to check on bird calls and was very excited to report a purple-crowned Lorikeet. I braved the elements with my waterproof jacket and hood pulled up but the raindrops falling on my glasses, as well as my binoculars, were too much of a challenge for me especially as the Lorikeets were in a tree which was being whipped around by the gale force winds. I have come to the conclusion that I am only a fair weather bird watcher – and so I hope one day to see a purple-crowned Lorikeet in more suitable conditions. 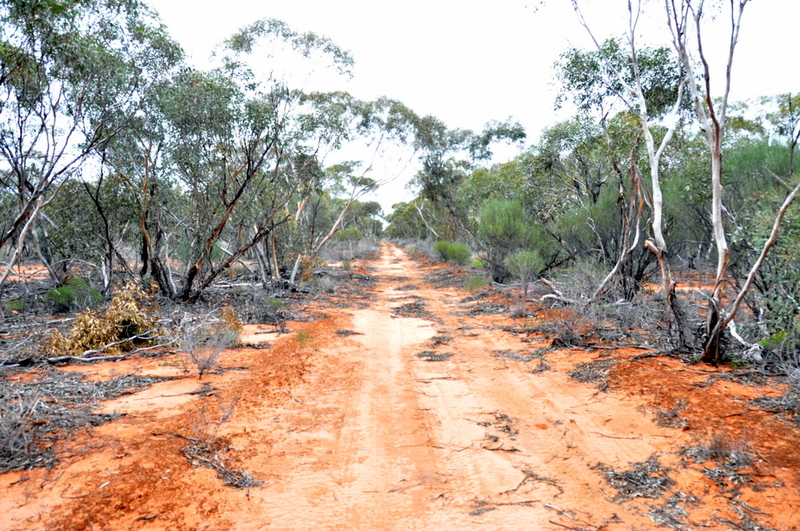 We’d been in Mallee country for several days and not had even a glimpse of a Mallee Fowl. We were keen to see one, especially as we are familiar with both the other megapodes in Australia and were curious as to their similarities. 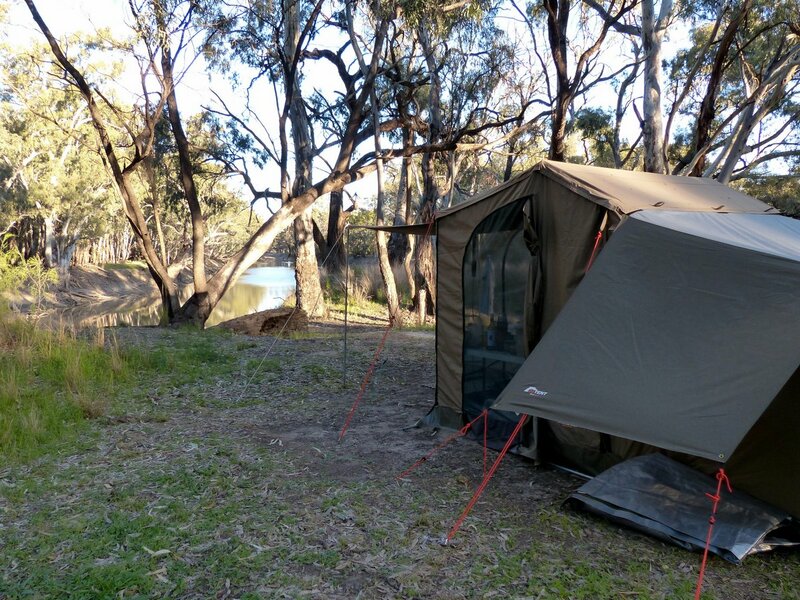 Mt Crozier camp-ground was our choice for a 5 day stay, it is quite a few kilometres into the park along a sandy track but well worth the drive. We had several days totally on our own, it was very peaceful, no road noise at all but there was some distant air traffic so we were not really isolated! 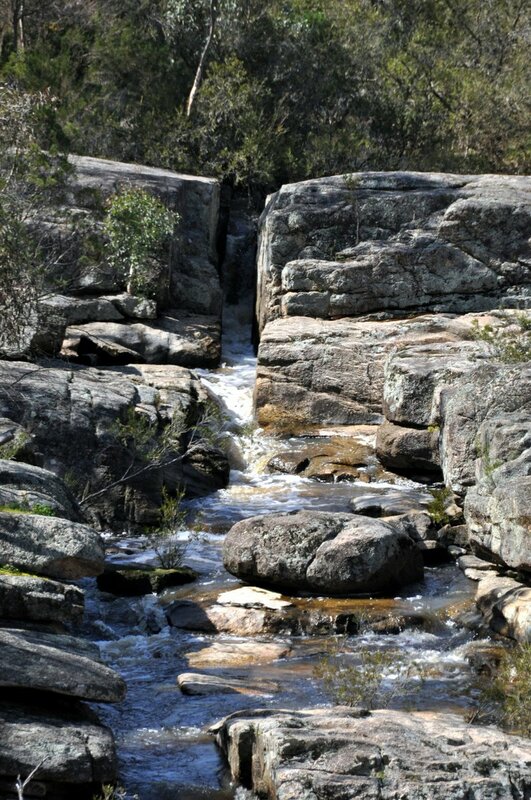 There are some good walks in this park as well as several long, overnight hikes for which we are not equipped and not particularly keen, physically or mentally. 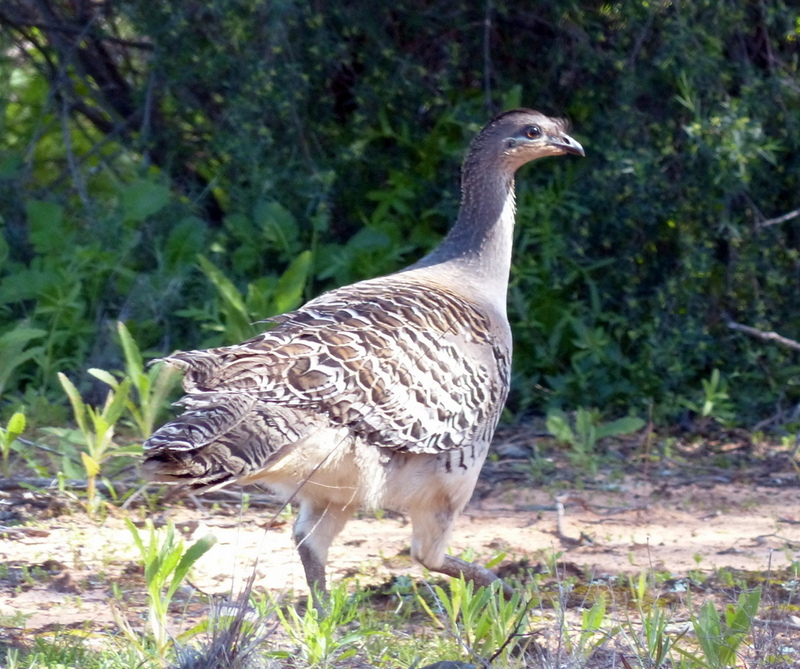 The Mallee vegetation and birds provided plenty of interest for us and on our first driving excursion further afield we did indeed see a pair of Mallee Fowl. They crossed the road quite quickly and once in the low vegetation their attractively patterned feathers provided an excellent camouflage as they moved away. 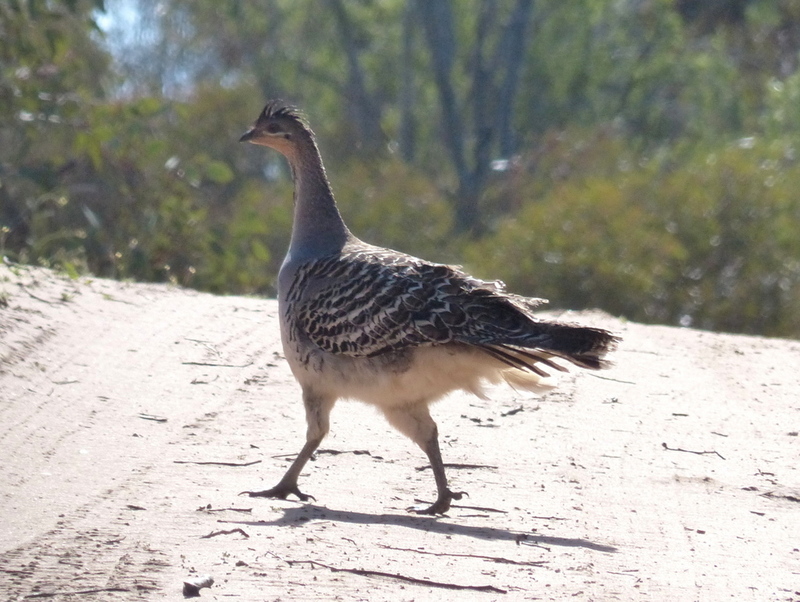 Our second sighting occurred just as we had passed by a sign informing us of the Mallee Fowl and its life cycle. The bird walked across the road just a short distance in front of us then froze in position on the very edge – not a good survival tactic against vehicles! It did, however, give us a wonderful photo opportunity so we thanked the bird and wished it well. 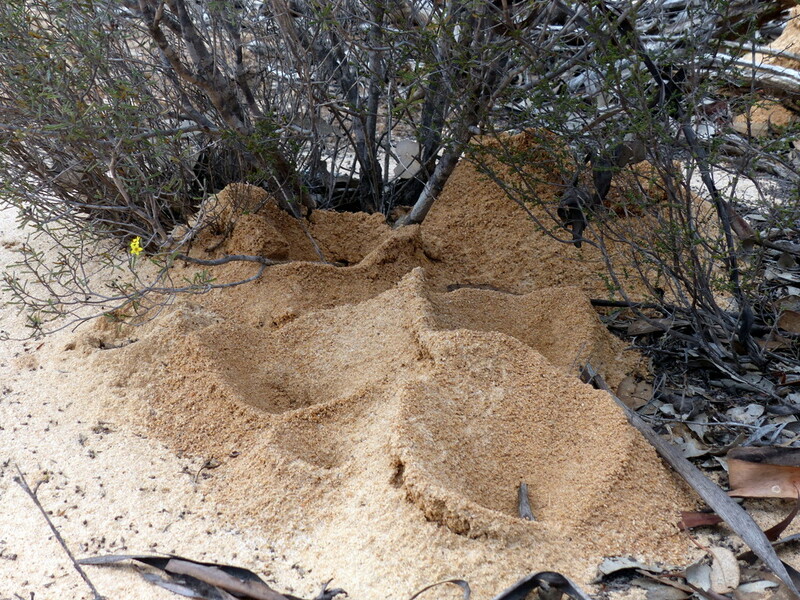 Everywhere we walked we were conscious of a variety of ant hills – in this dry, sandy environment ants take over from worms as the great recyclers of materials. 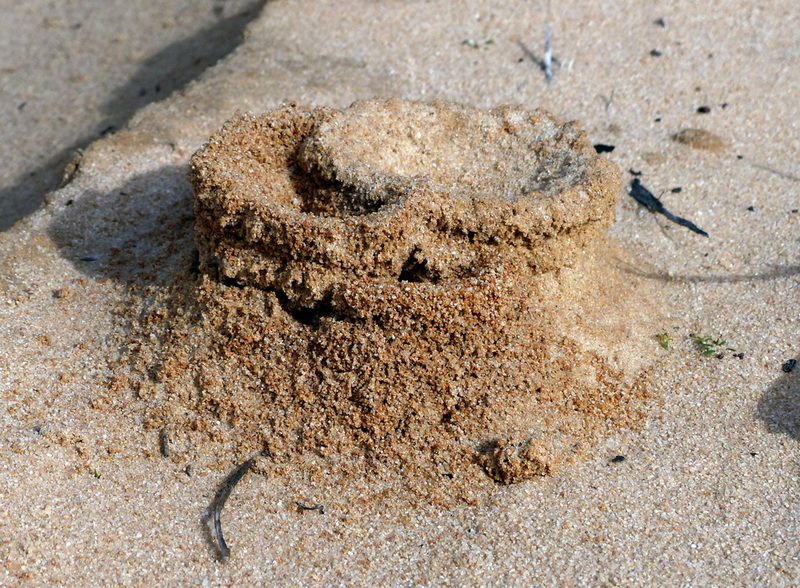 I was fascinated by the many different varieties of ant as well as by their constructions. The top photo shows some ‘ant apartments’ or strata title residences and the lower one a small suburb built around a shrub. And getting back to the birds: amongst one mixed group of blossom feeders we came across a party of Miners on a windy afternoon, presumed they were Yellow-throated Miners without looking carefully, as the wind was increasing in strength and it was very cold. Allen thought about it overnight as there were several features that, on reflection, didn’t seem quite right. 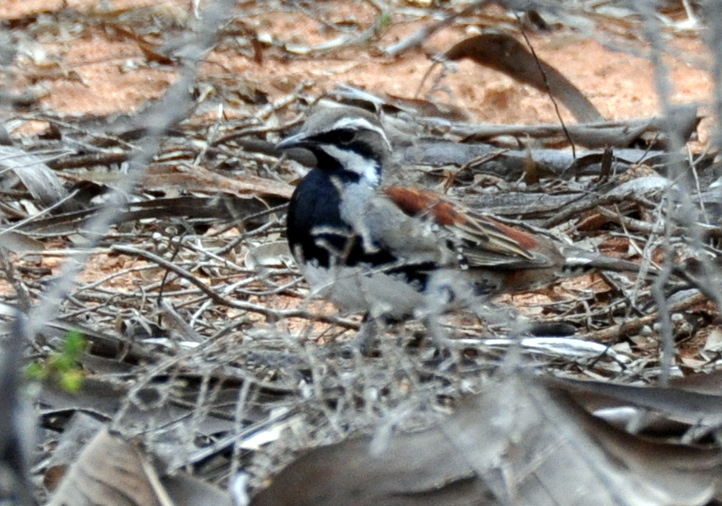 So the next morning we drove back to the same area and there, feeding on the same tree was a group of Black-eared Miners. 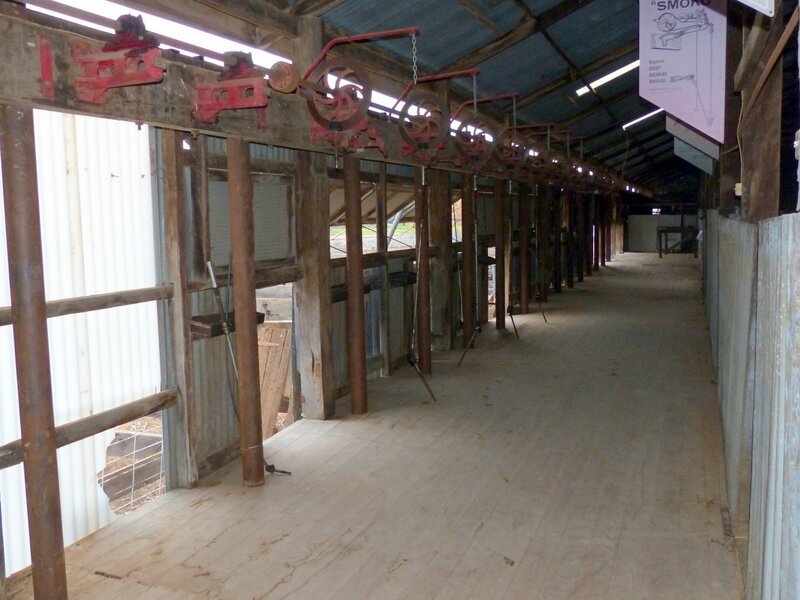 We carefully checked each feature and they conformed in every way. 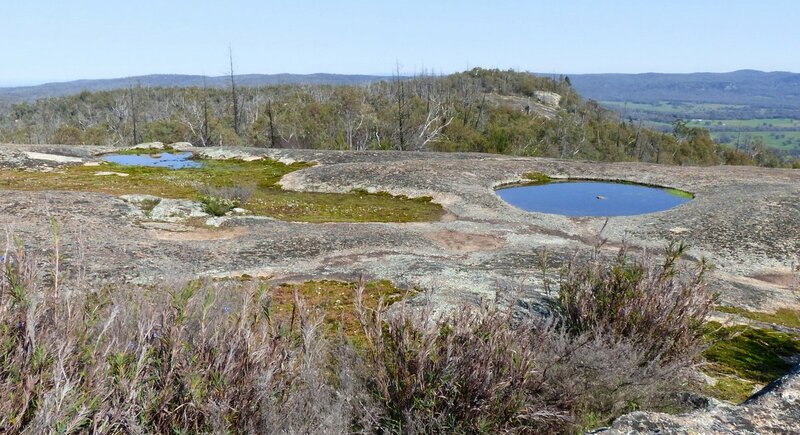 A week later we arrived in Gluepot and discovered that some of the Gluepot Black-eared Miner population had been translocated to Murray-Sunset National Park as a safety measure in case of wildfire causing major damage to this threatened species. No photos of the BeM as we were too far away and they move fast. 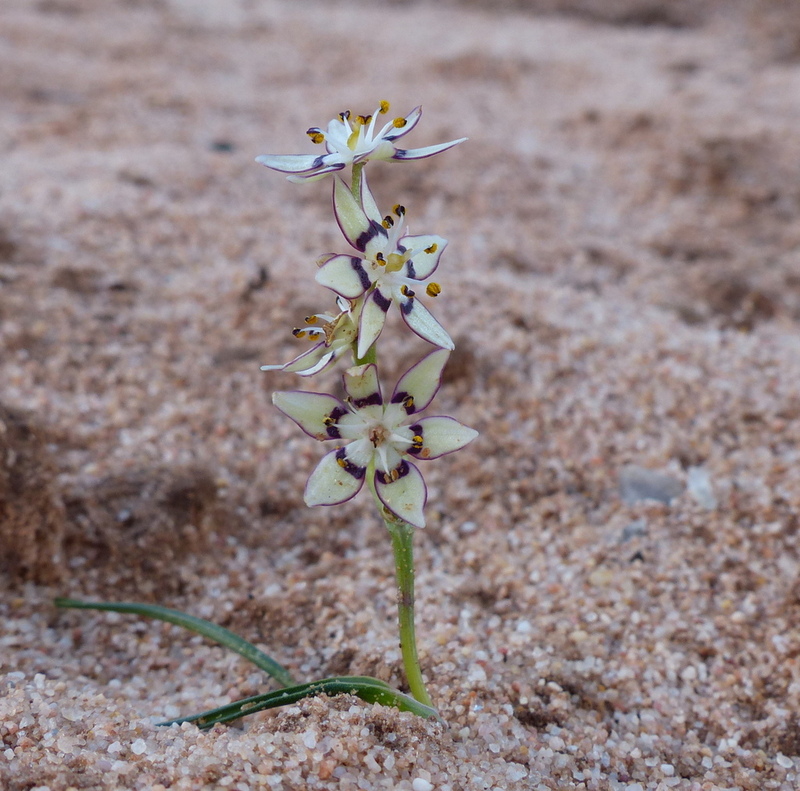 This tiny Liliaceae caught my attention, a solitary plant growing in the sand. 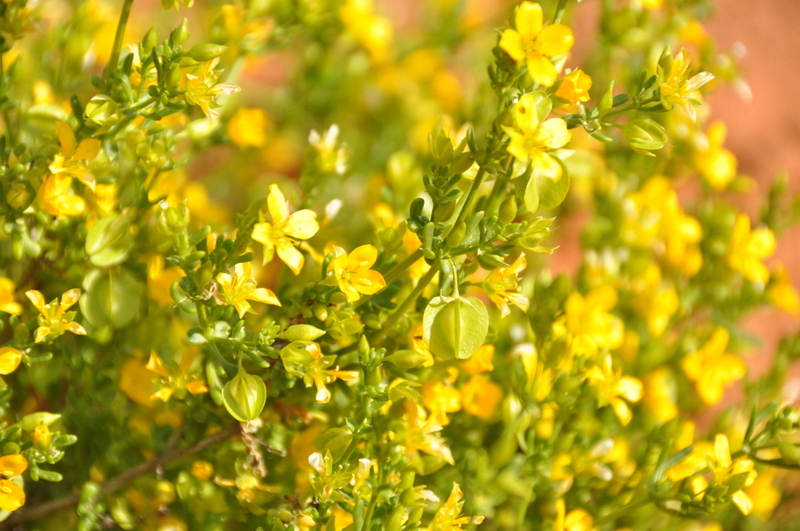 I later found large areas of it growing amongst other grasses and low herbs. 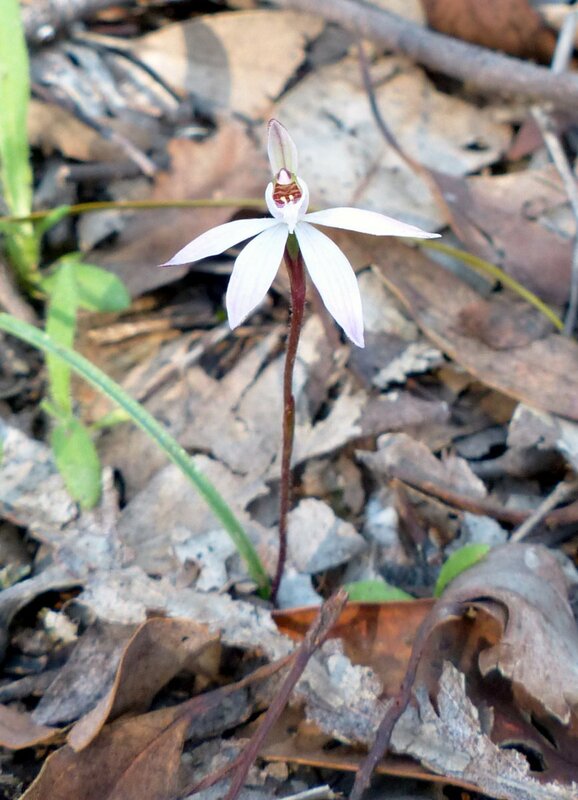 It goes by the delightful name of Early Nancy which flows more easily than its botanical nomenclature Wurmbea dioica. It is a challenge to pick out one or two highlights when we had so many wonderful experiences here so I’ll finish off with some colour. 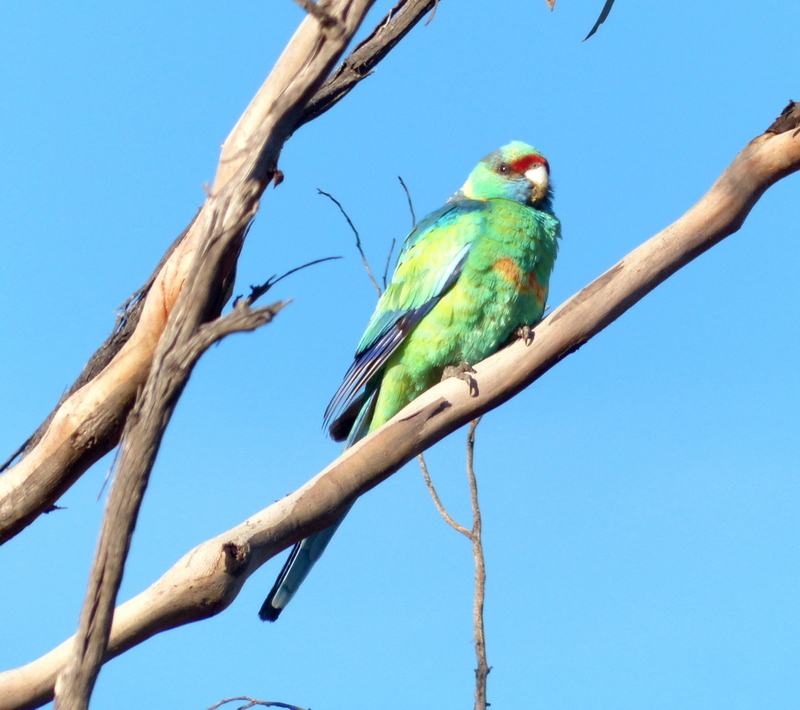 The parrots in this part of the country are an absolute delight. 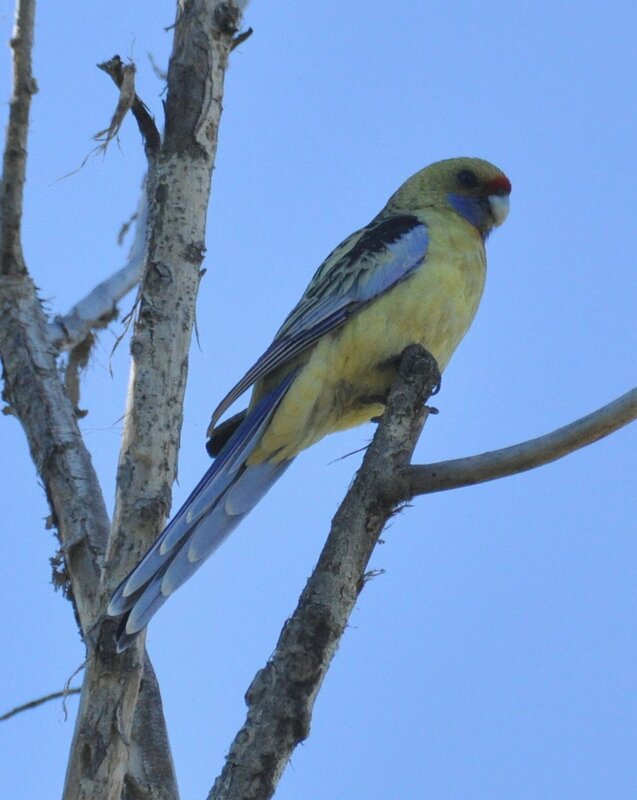 The Mallee Ringneck has probably been our most frequent parrot sighting during this trip but we never tire of them. 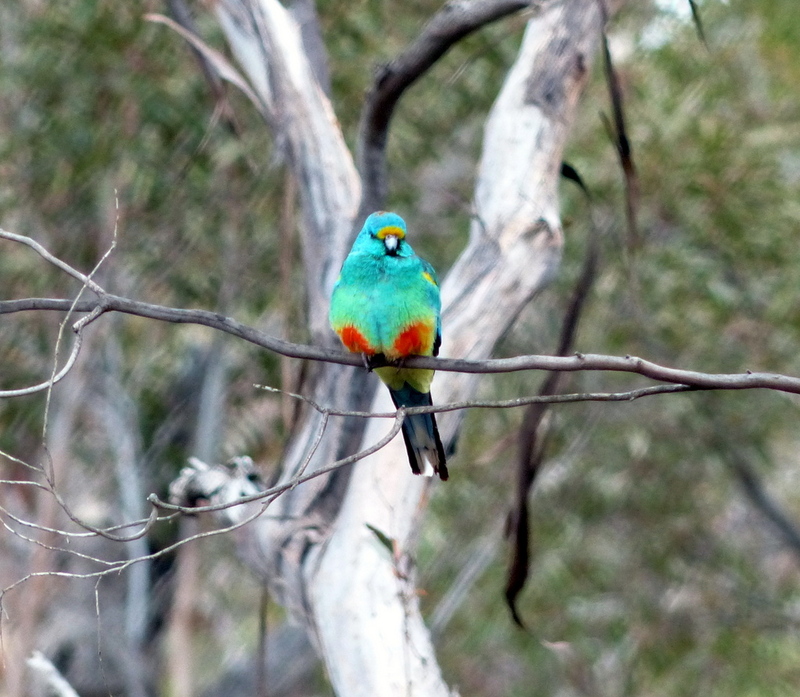 And we still reach for the binoculars to enjoy any sighting of the gorgeous, multi-coloured Mulga parrot. This male was patiently sitting about waiting for his mate to emerge from a nesting hole nearby. Even when he turned his back he was still gorgeous! 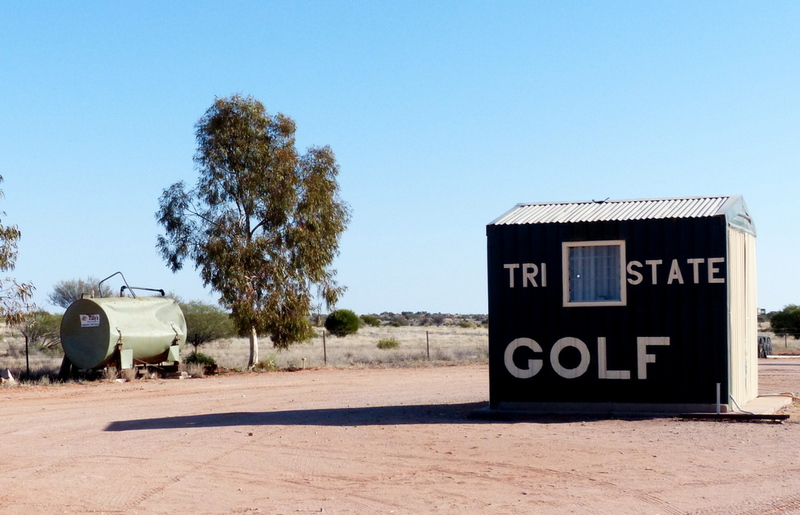 Broken Hill was interesting to explore and we enjoyed our morning at Silverton, especially sighting the Chirruping Wedgebill on the way there, but after two nights in a van park we were well and truly ready for some bush camping. Our journey continued on the Silver City Highway, heading south – through Wentworth where we crossed the Darling river and then just a few minutes later we were crossing the mighty Murray and entering the state of Victoria. Mildura provided us with an opportunity to restock provisions but as we set off down the road again we saw dark clouds gathered on the horizon. 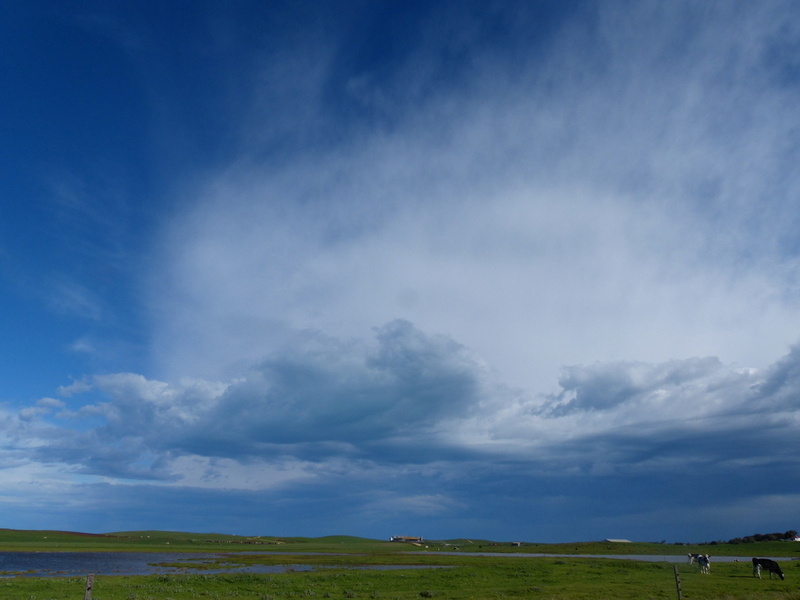 As we drove towards the clouds the sky became darker and we were soon driving through a heavy shower of rain. A lunch stop was postponed and snack bars consumed as we continued towards Hattah-Kulkyne. 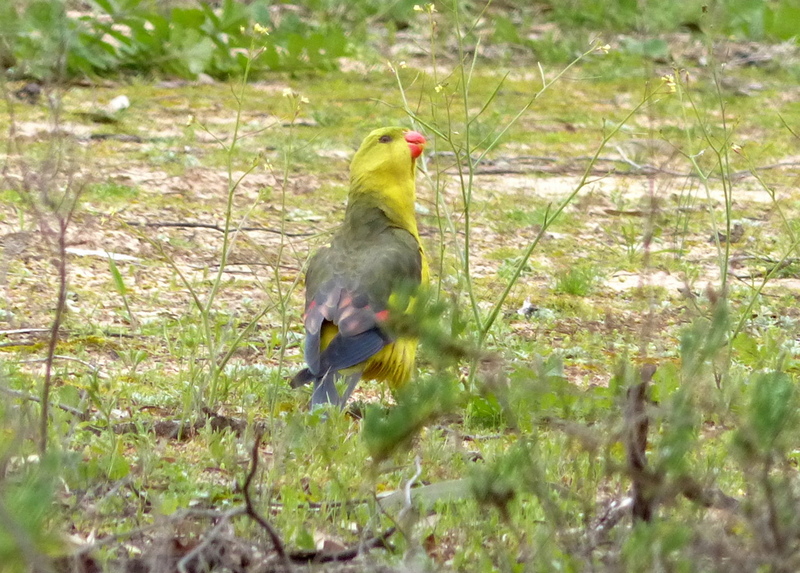 By the time we entered this well known and loved National Park the rain had eased and the beautiful sight of Regent Parrots feeding on the roadside we took as a very welcome sign. 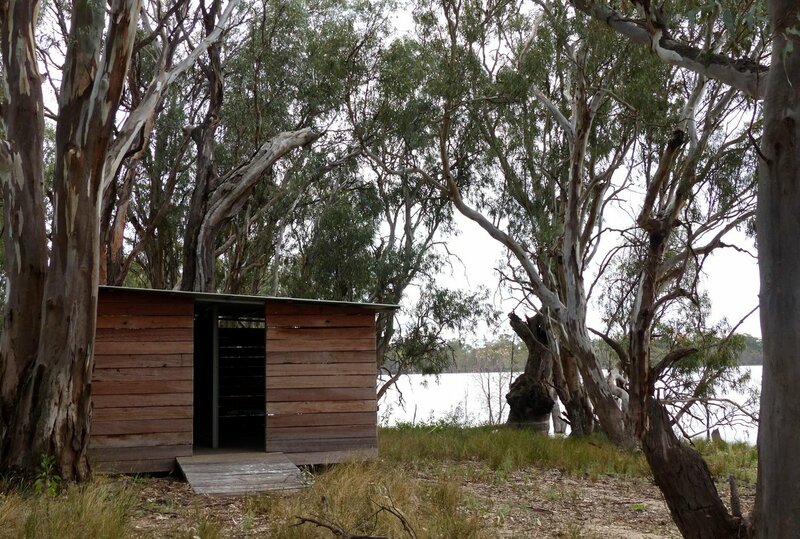 Majestic old River Red Gums lined the edge of Lake Mournpall but the camping areas are set away from these well known ‘widow makers’ and amongst the much safer Black Box – (Eucalyptus largiflorens), still with a lake view from the tent. 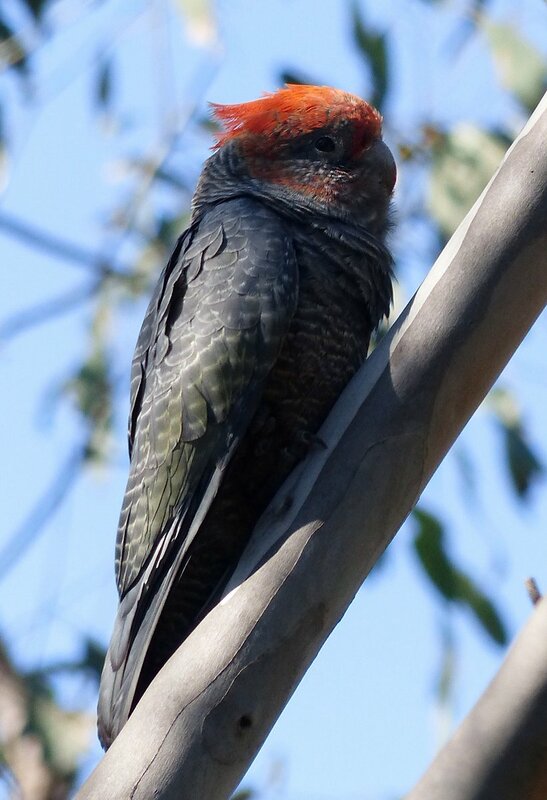 There are so many suitable nesting holes in all those fabulous ‘Gums’, it was a delight to watch Mallee Ringnecks, and Galahs checking out holes and taking in some leafy material to make a comfortable nest. 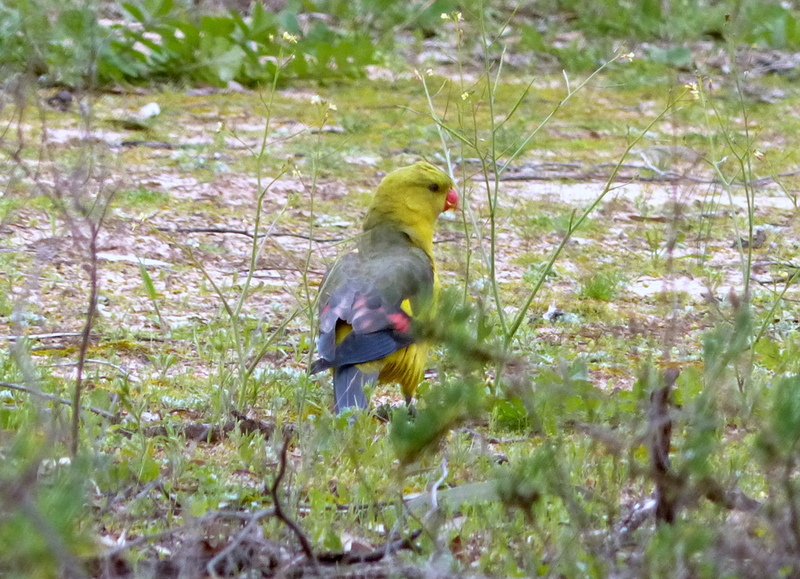 Yellow Rosellas were also present in large numbers, they have the most delightful bell-like call, another new species for us. 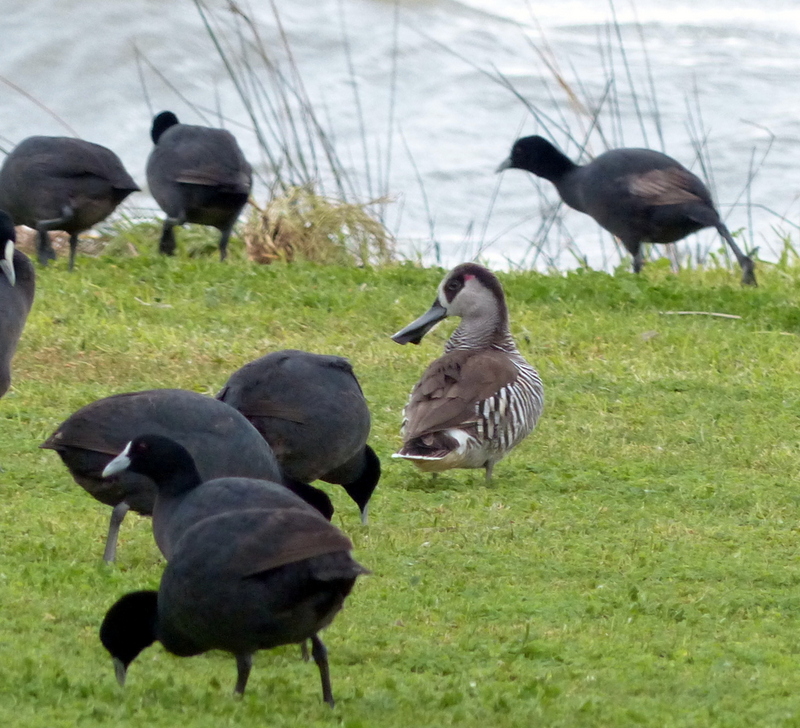 While Lake Mournpall was home to Australian Shelduck, Grey and Chestnut Teal, Pelicans, Australasian Grebes, Black-winged Stilt and Wood ducks, they were few in number. Late one afternoon we visited Lake Hattah which has much less water remaining and many, many more birds. 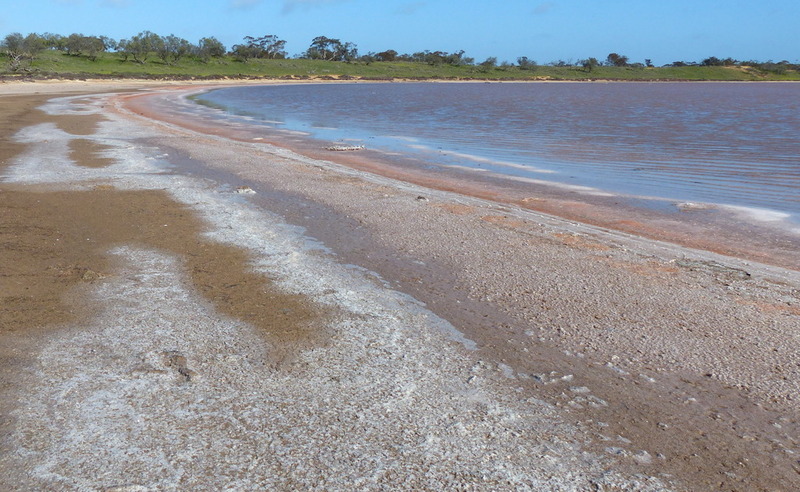 Hundreds of Red-necked Avocet, Black-winged Stilt and Grey Teal moved across the shallow water feeding. Neither of us had ever seen Avocet and what a fabulous sight they were, we stayed until the sun went down just enjoying the spectacle and watching them feed, preen gather together, fly up across the water and then alight to begin feeding again. We covered quite a lot of the tracks in the park, by vehicle as well as on foot, we saw some wonderful birds and enjoyed the scenery tremendously. The weather, although cold didn’t stay wet and we made the most of every ray of sunshine! Although both ex-Victorians we had quite forgotten about the vagaries of the weather in this southern state. We had another couple of special moments of seeing a ‘new’ bird; Chestnut-backed Quail-thrush – a long look at both male and female, and a good look at male and female Gilbert’s Whistler. There was 3G coverage at our camp so when the forecast of yet another cold front appeared we decided to move our base on a fine day and set off for Murray-Sunset N.P. – just down the road. Cameron Corner provided an interesting destination for a morning excursion from Fort Grey. After 32 km of corrugated, but otherwise reasonable, unsealed road we drove out of NSW, opening and shutting the gate carefully, travelled perhaps 100 metres through SA then did a right hand turn into Queensland. 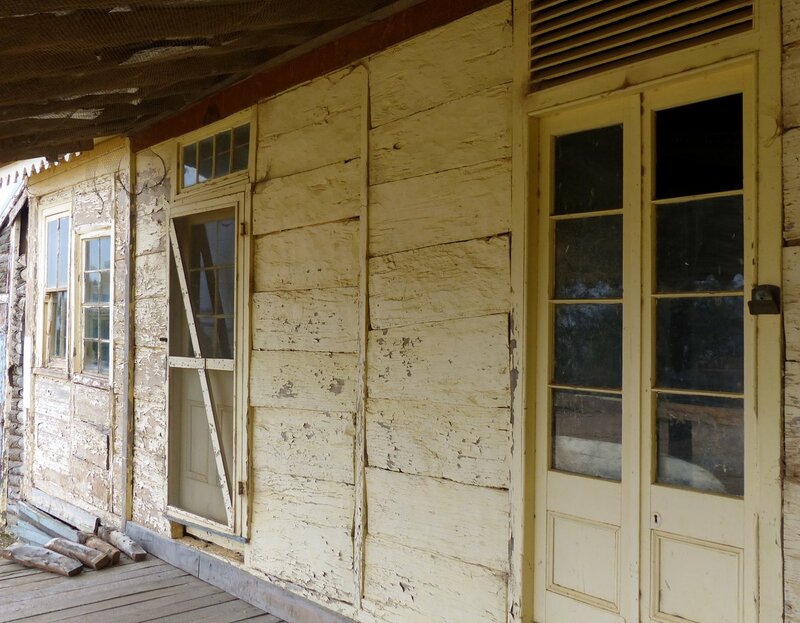 This meeting place of 3 states is named for John Cameron, a surveyor for the NSW Lands Department, who led the first survey party along the NSW- Qld border between 1879 & 1881. 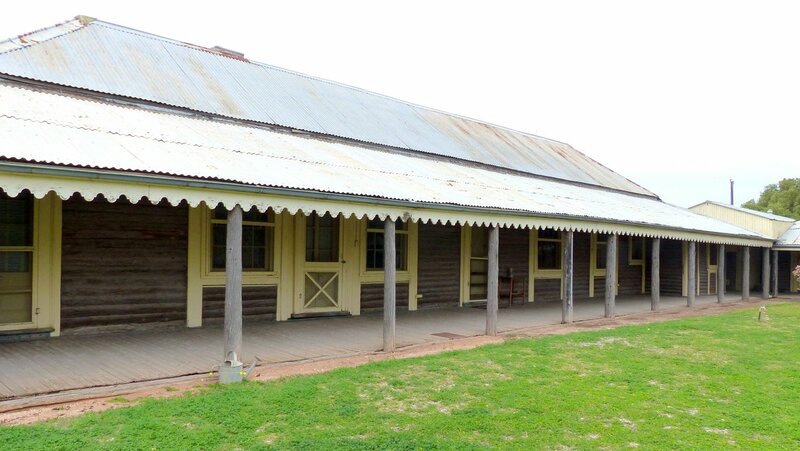 On his arrival at “the Corner” in September 1880 (twelve months after starting in the NSW border town of Barringun) he erected a wooden boundary post with the inscription “Lat 29”(latitude 29 degrees) and “Cameron”. There is a “Corner Store” which has some very basic supplies including fuel, gas and alcoholic beverages but their real draw-card is the golf course where you can play Tri State Golf. 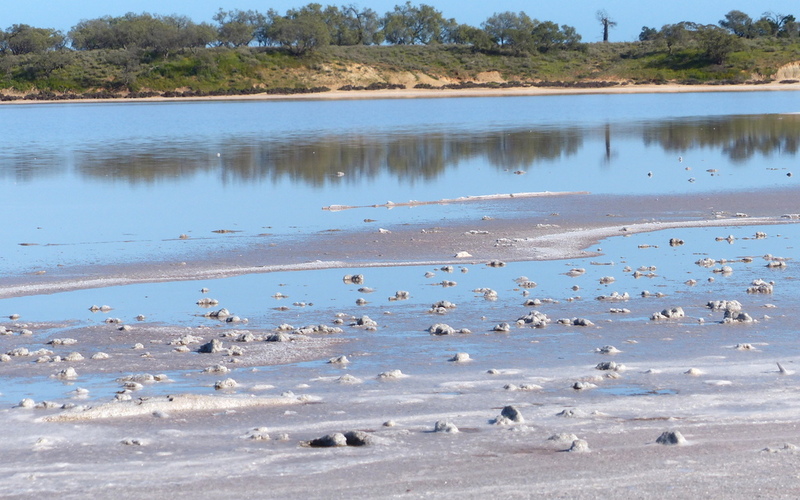 The approach to one of the “browns” – no watering to do here Gouldiae! 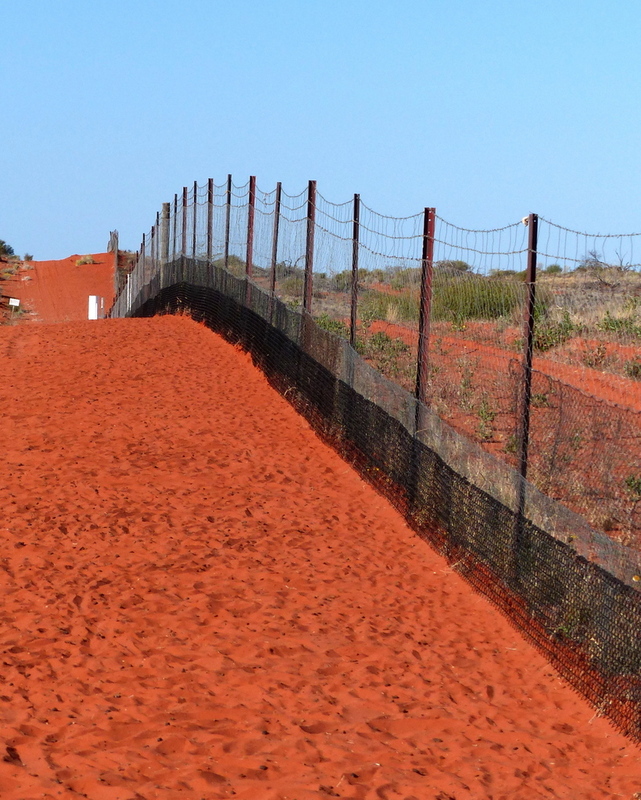 The other main attraction here is the Dingo Fence –it is the longest fence in the world stretching 5,614 kilometres with quite a long history. 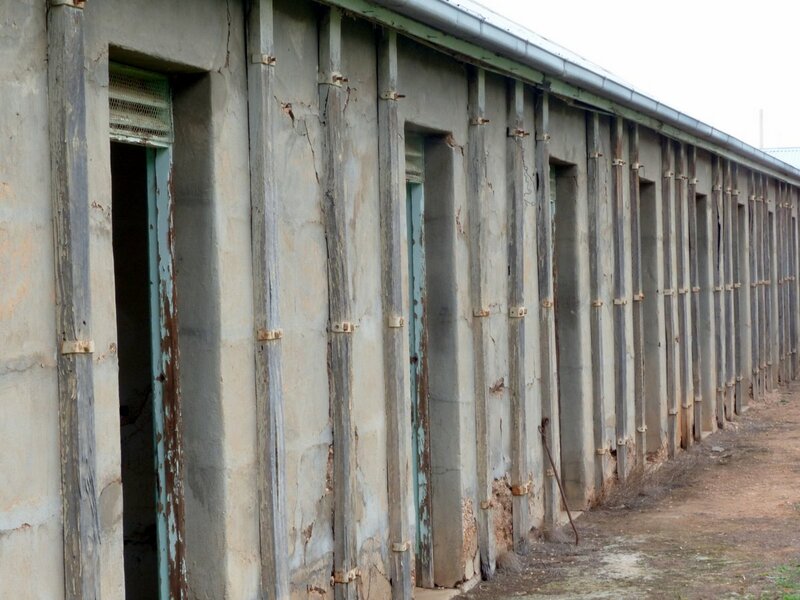 State governments built fences in the 1880s to try and control the rabbit plague but the fences fell into disrepair as rabbits continued to proliferate. 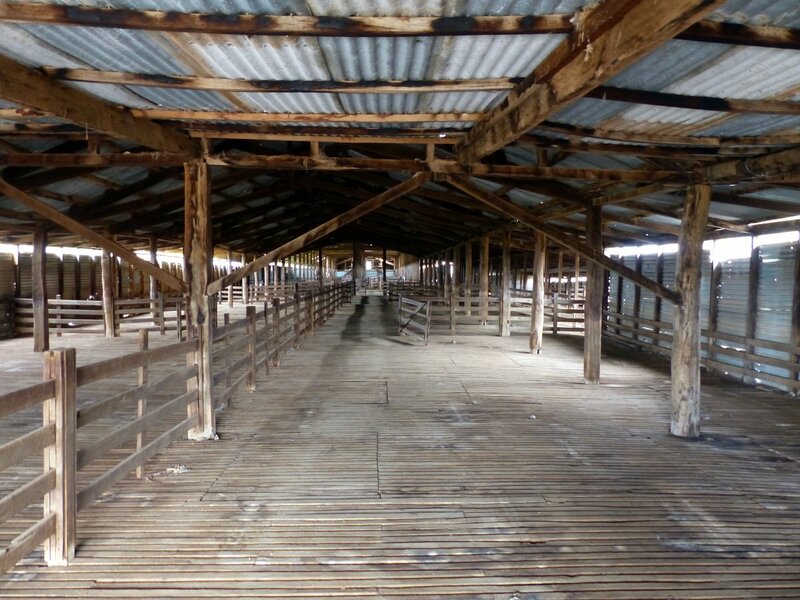 In 1914 the fences were repaired to try and keep dingoes out of sheep grazing country and in the 1940s they were joined into one continuous structure. 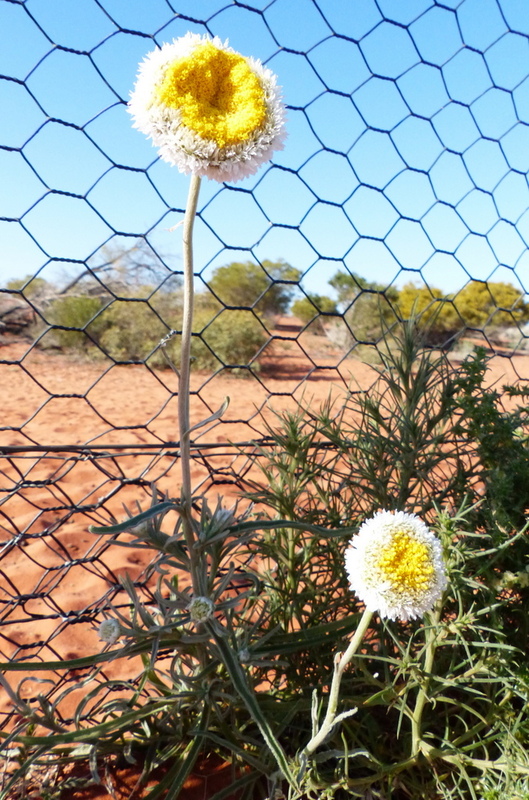 Queensland authorities constructed and maintained the fence until 1919, however it is now maintained by the Wild Dog Destruction Board which employs boundary riders for each 60 km of fence. 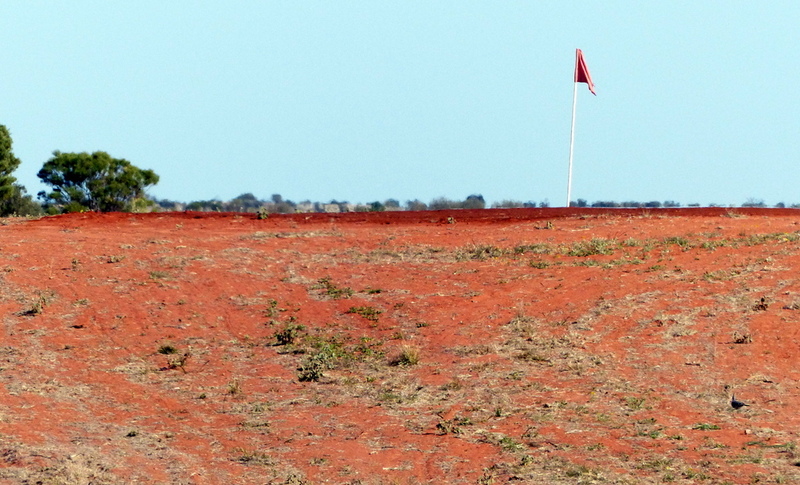 According to information on the sign at Cameron Corner, funding is provided by NSW government grants and by levies on graziers. 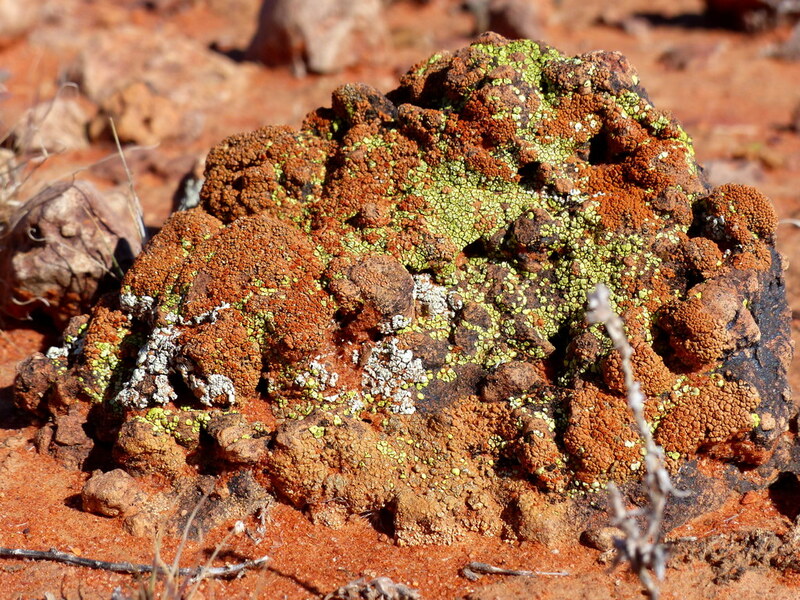 Photo below is a close up of one of the larger rocks on the gibber plain – we were fascinated that lichen could survive in this climate. 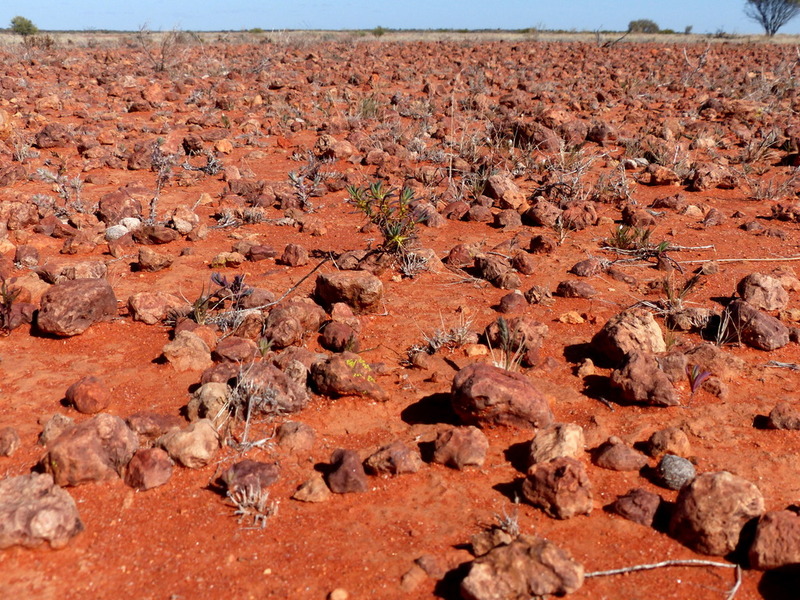 This is the view across the gibber on the Cameron Corner road, it is not at all easy to walk across but we did traverse a small area and certainly looked at many similar landscapes in a vain hope to see a Gibber bird. We have been lucky with many wonderful bird sightings but not that one …… yet.